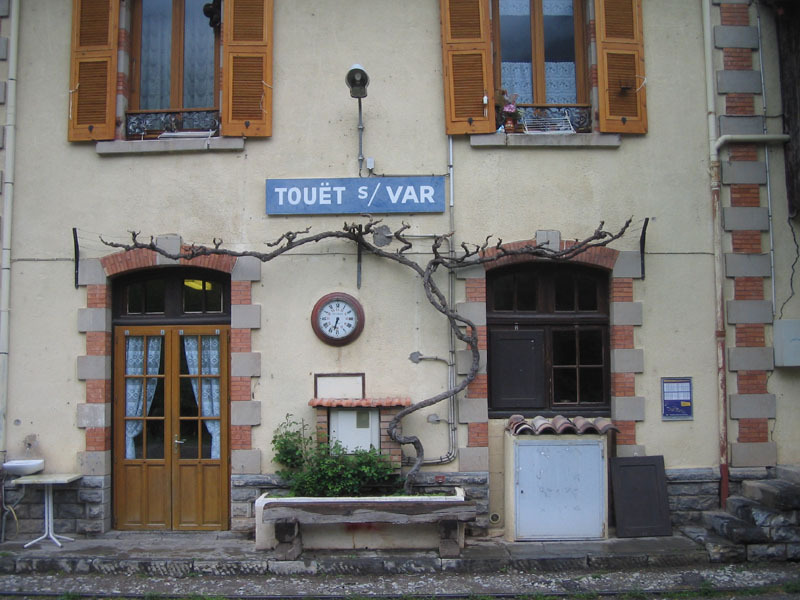 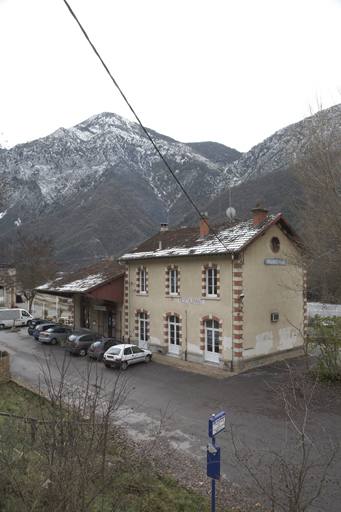 The final image of the station at Villars-sur-Var is taken from the road side in winter. 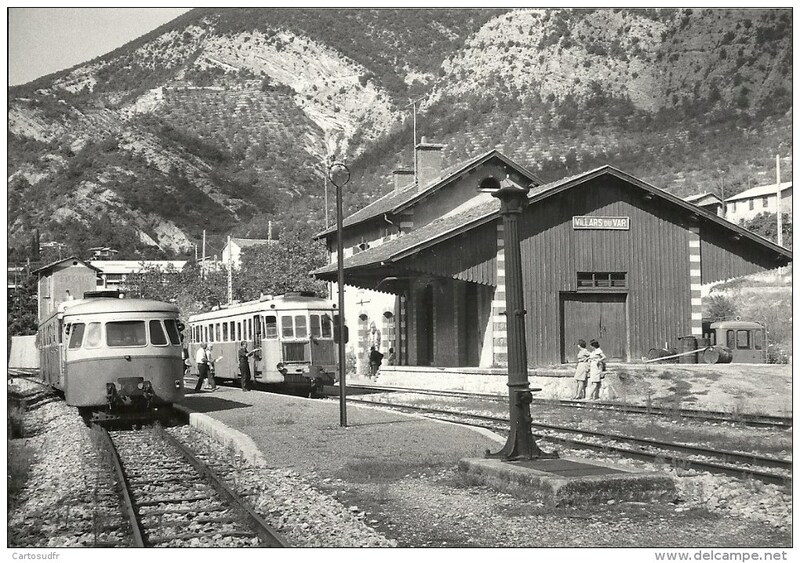 Travelling on from Villar-sur-Var the line closely follows the northern bank of the river as far as the station at Plan Souteyran. 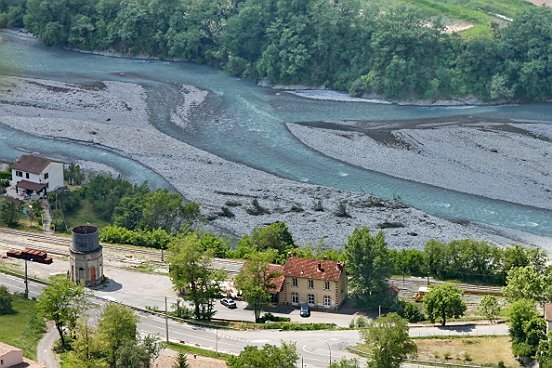 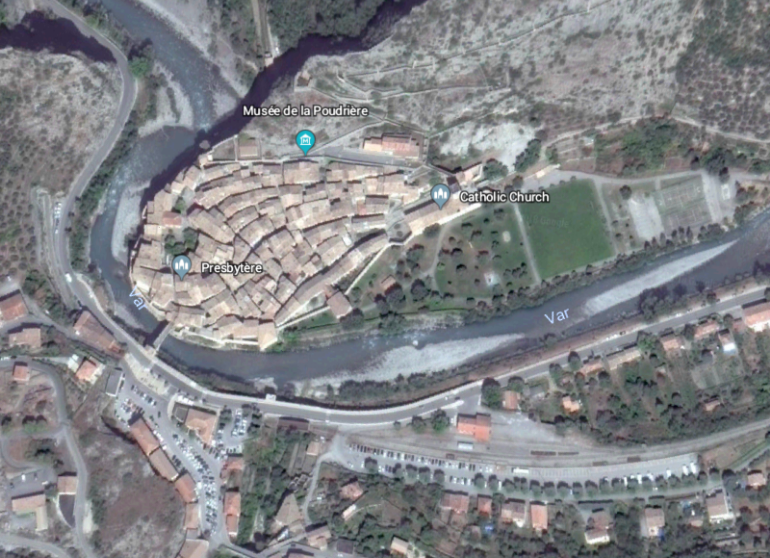 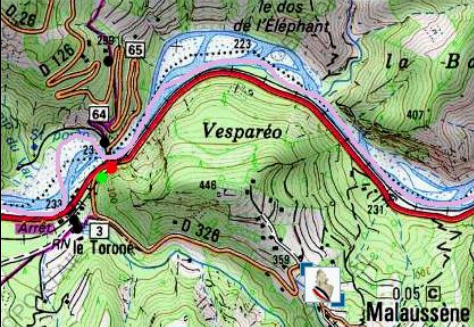 In that length of the line the river meanders back and forth and only very occasionally is the line more than 100 metres from the River Var. 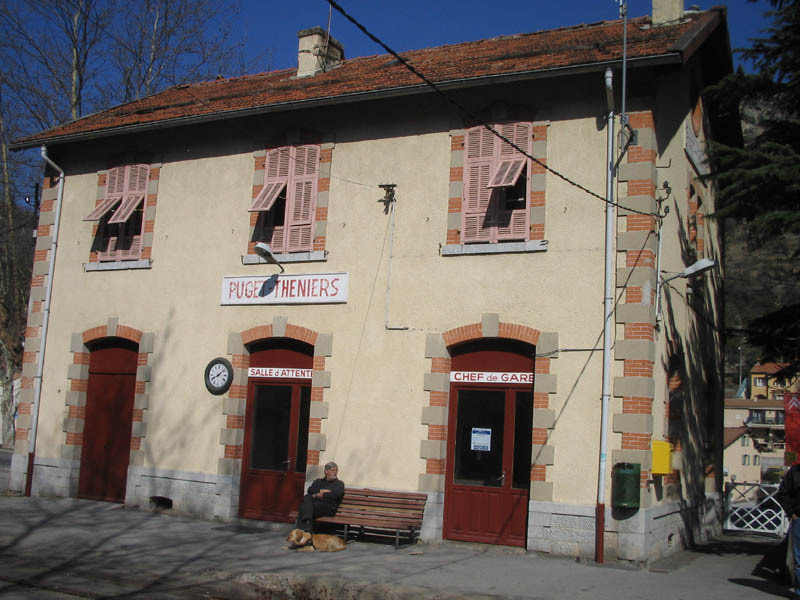 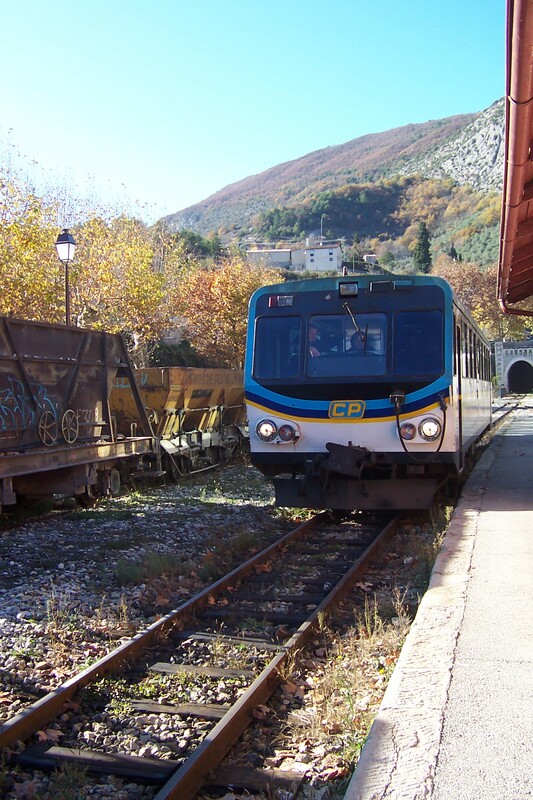 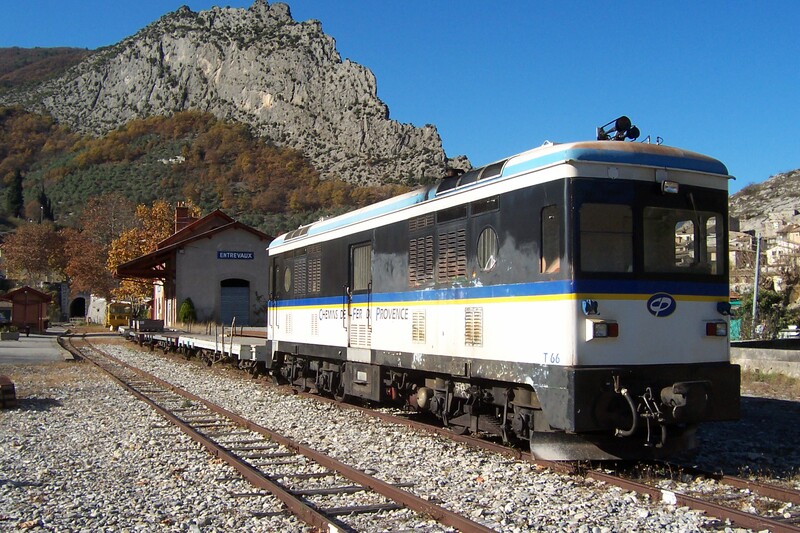 The “Train des Pignes” operates out of Puget-Théniers on parts of the 151 km metre-gauge Chemins de fer de Provence (CP). 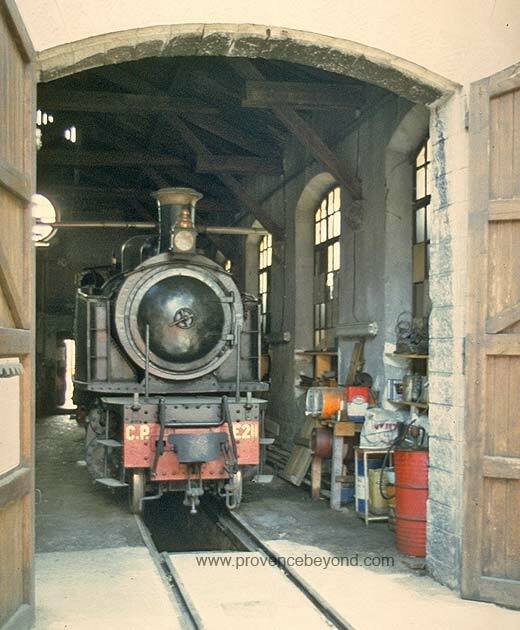 The steam trains run by the GECP which was founded in 1975 when the line was seriously threatened with closure. 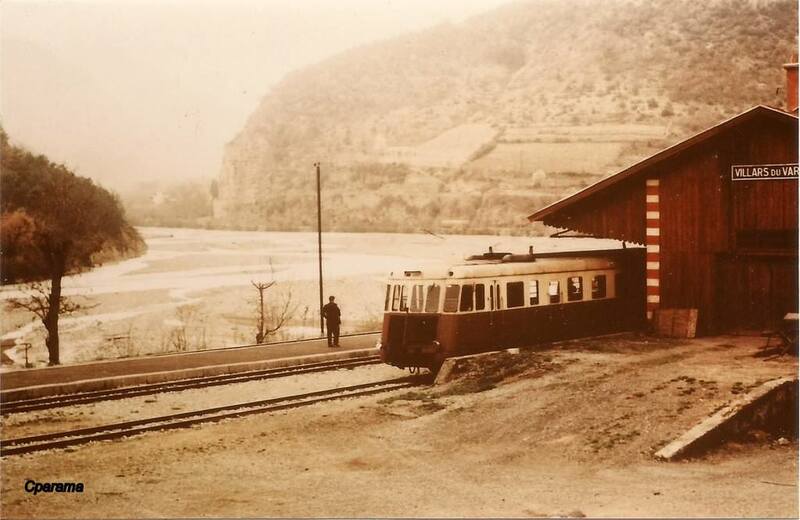 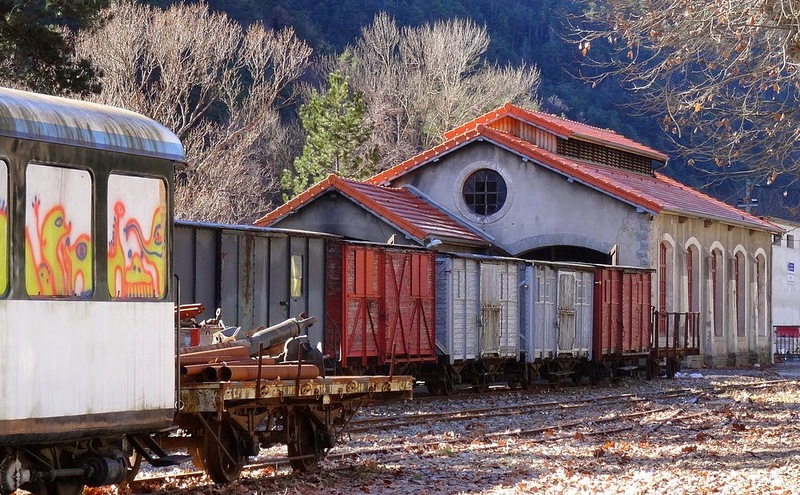 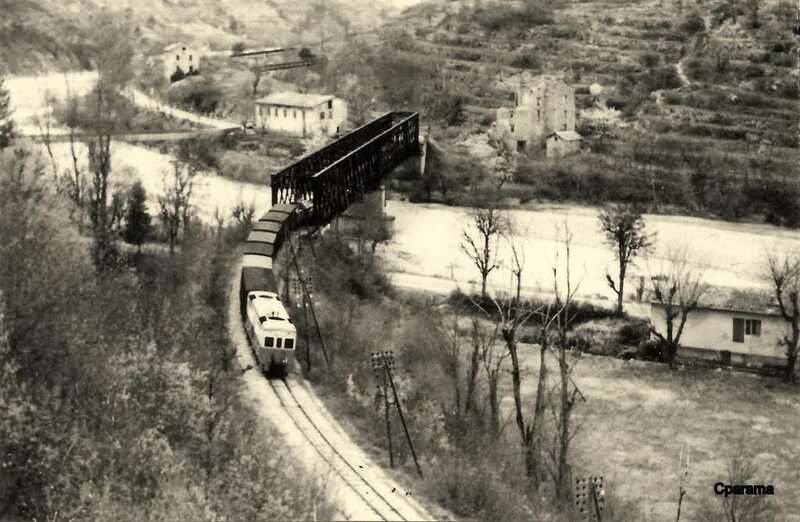 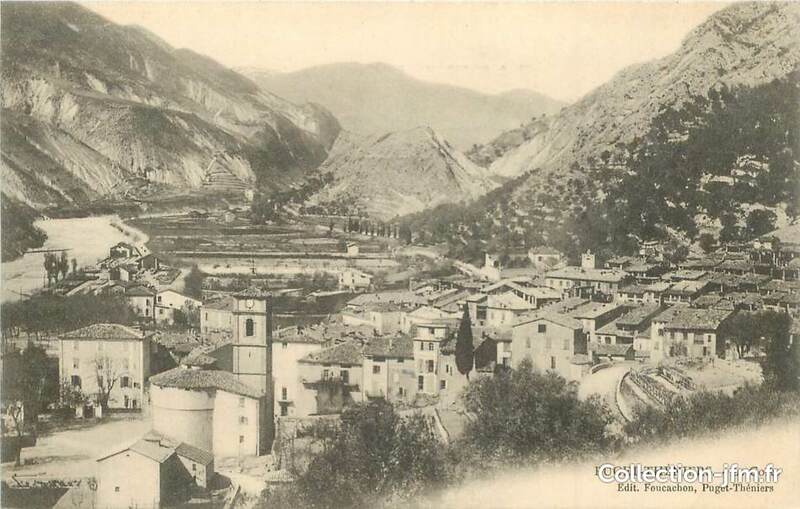 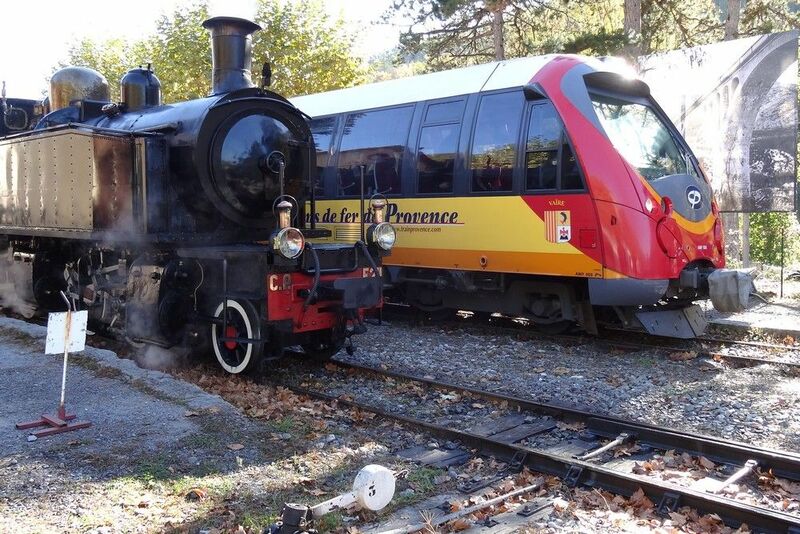 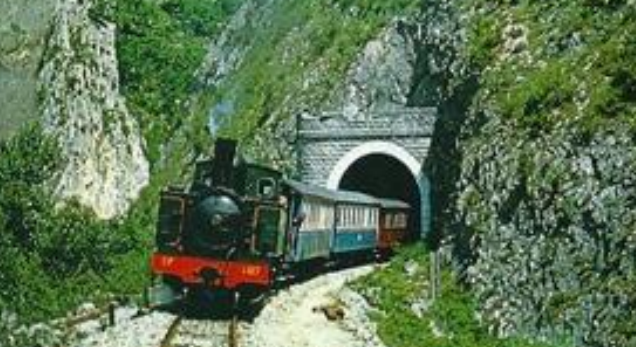 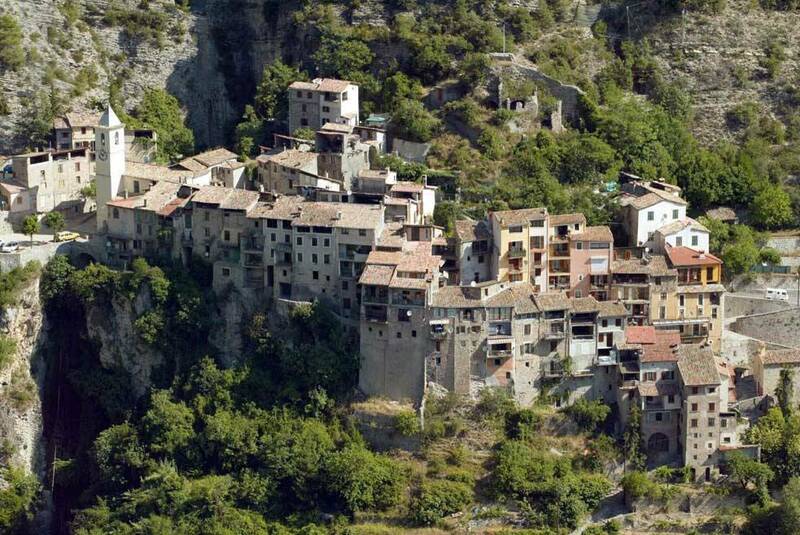 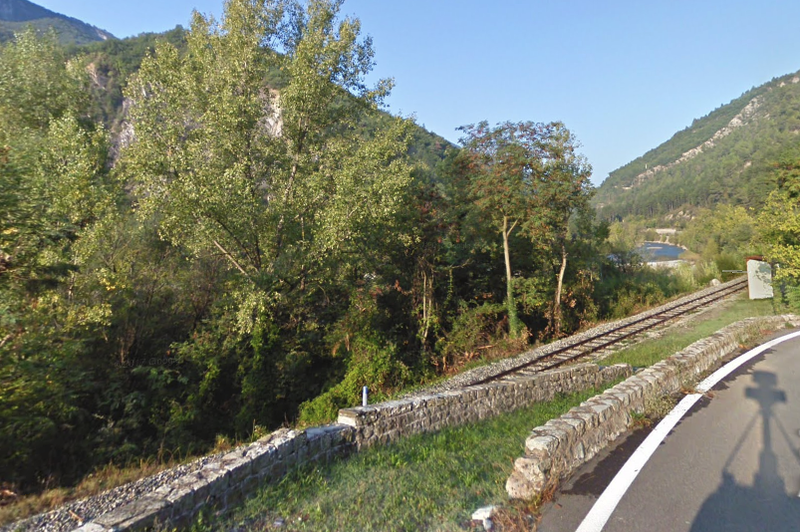 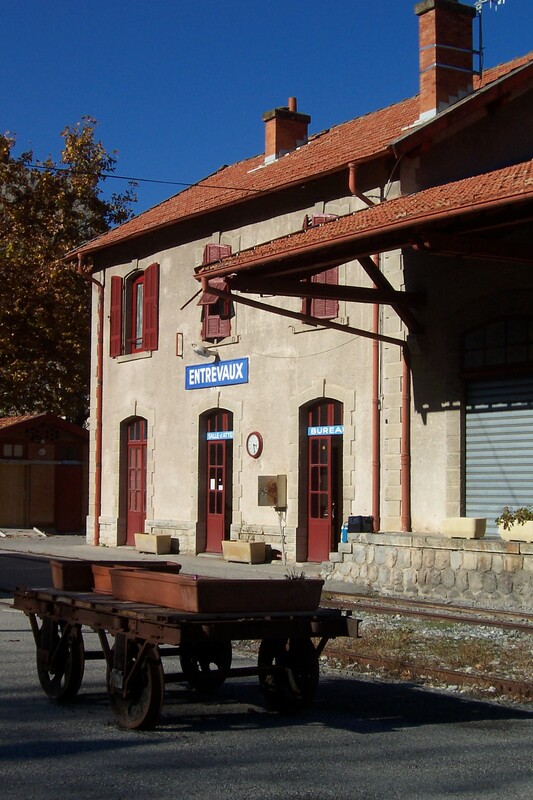 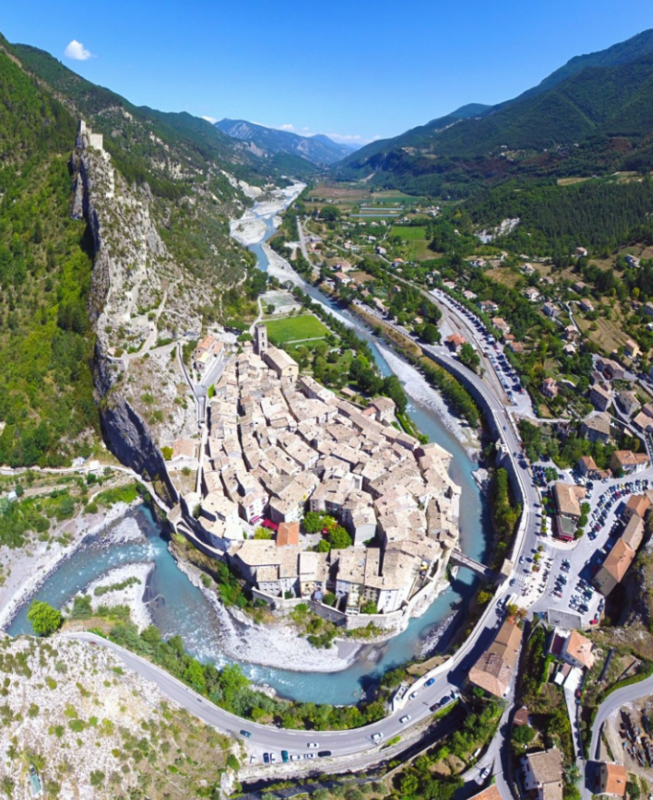 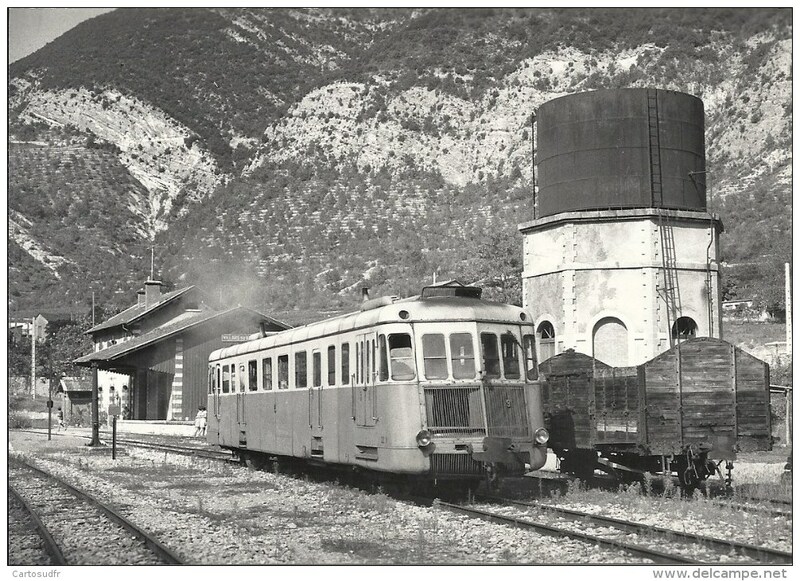 Most trains operate to Annot (a distance of around 20 km), with an intermediate stop at Entrevaux, on select days from early May to early November and are hauled by ex-CP (Portugal) 2-4-0+0-6-0T Mallet E 211 (Henschel 19874/1923). 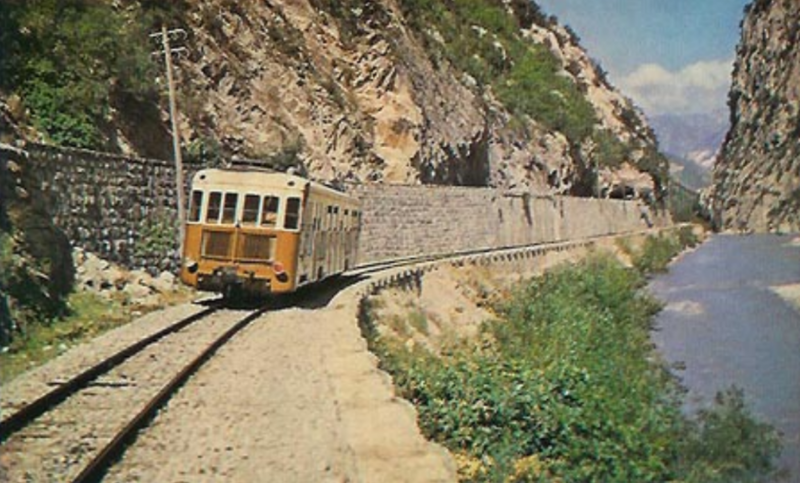 In Portugal, the loco was in use out of Sernada on the Val de Vouga lines until 1975, out of Lousado from 1975 to 1976 and out of Regua on the Corgo line from 1976 to 1981. 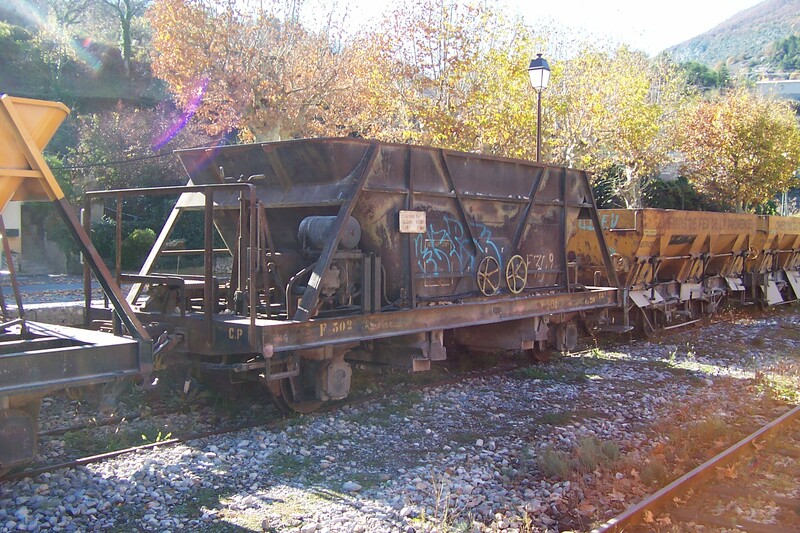 The loco was sold to the GECP in 1986, she first saw use on the CP between 1988 and 1992, after which she went through a major overhaul at the Lucato Termica workshops in Castelletto-Montferrato (Alessandria, Italy) only to return to service in 2010. 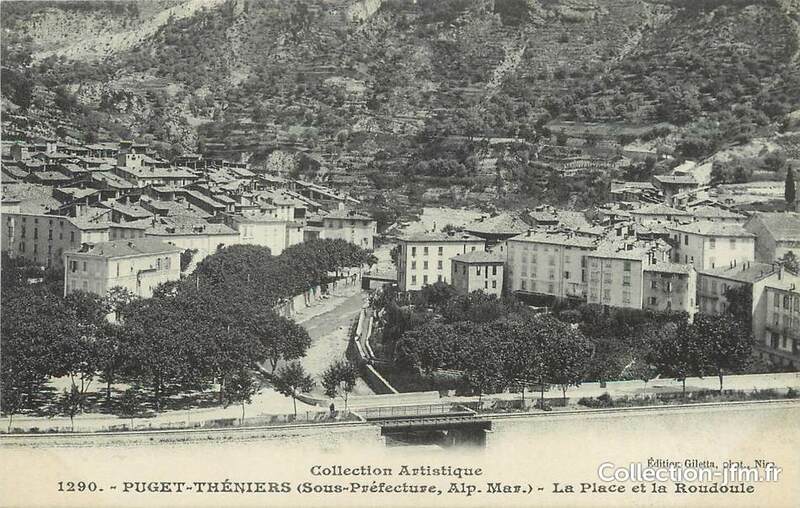 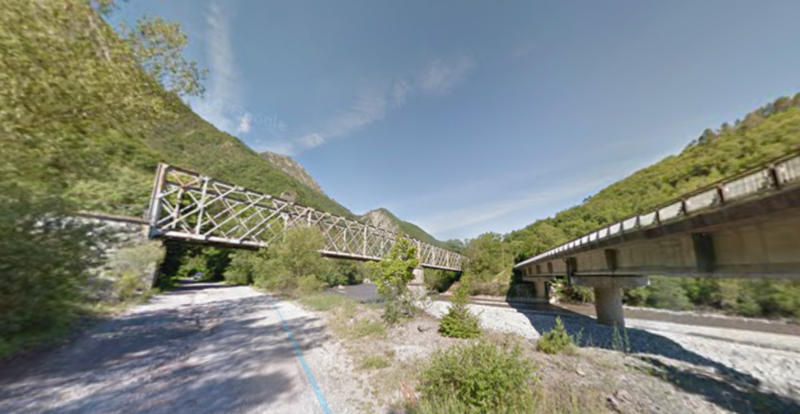 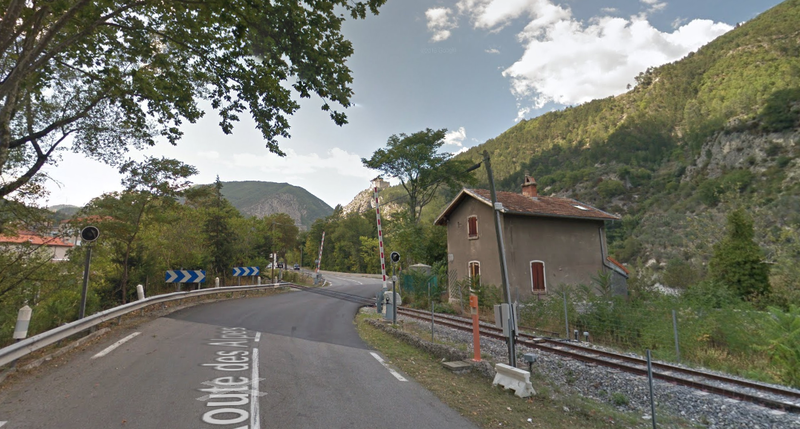 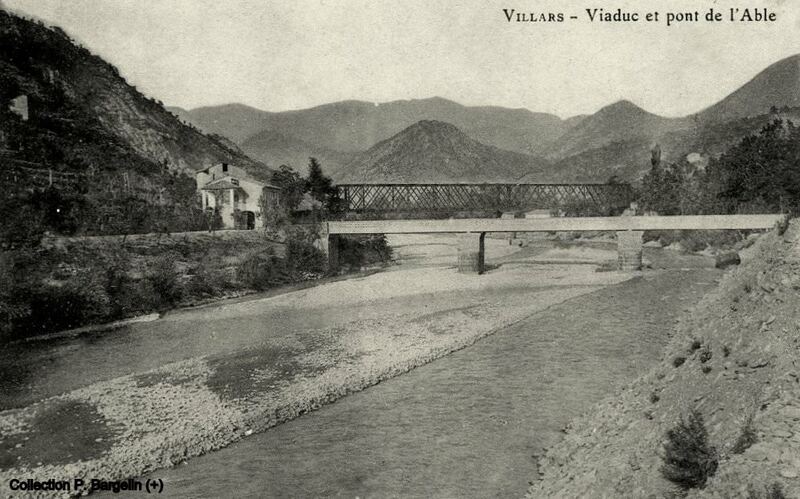 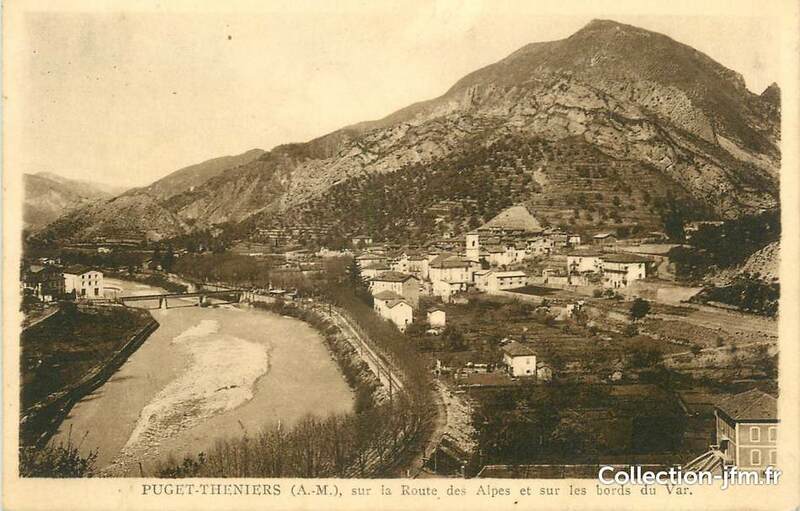 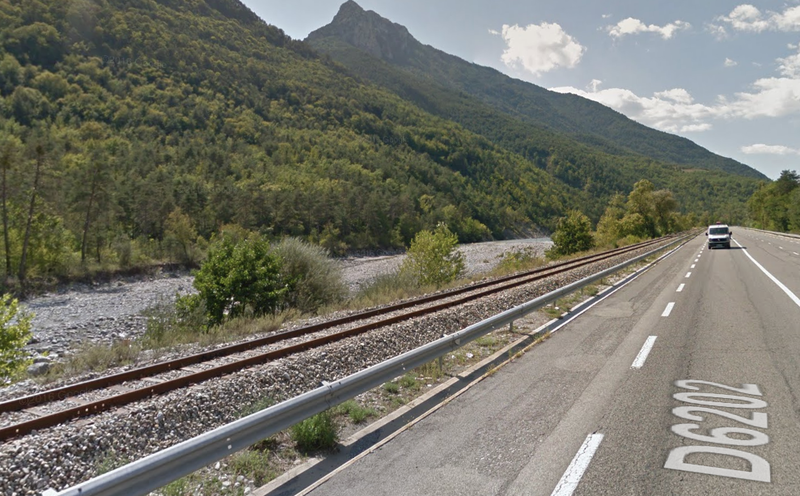 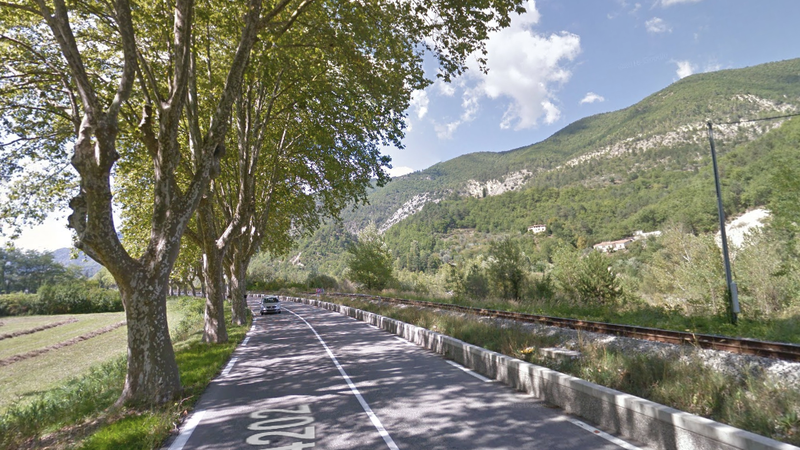 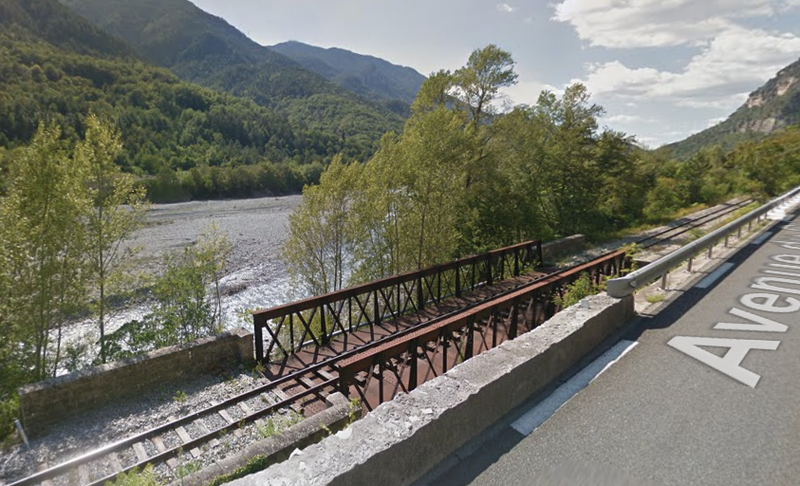 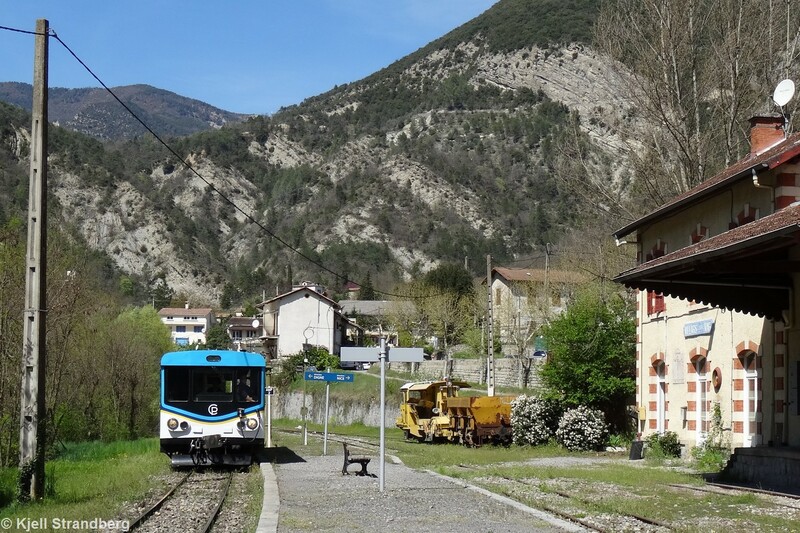 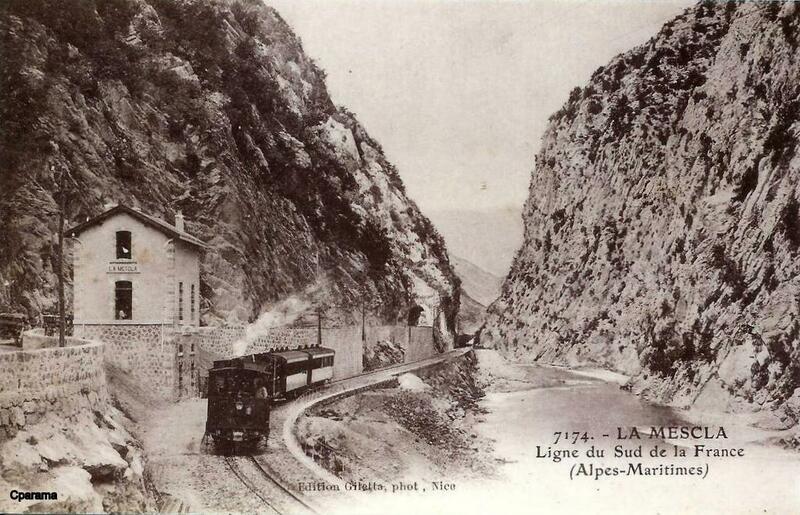 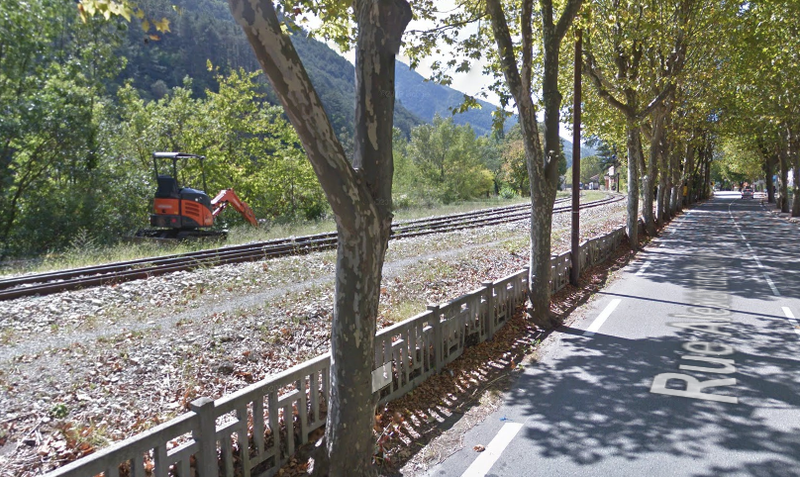 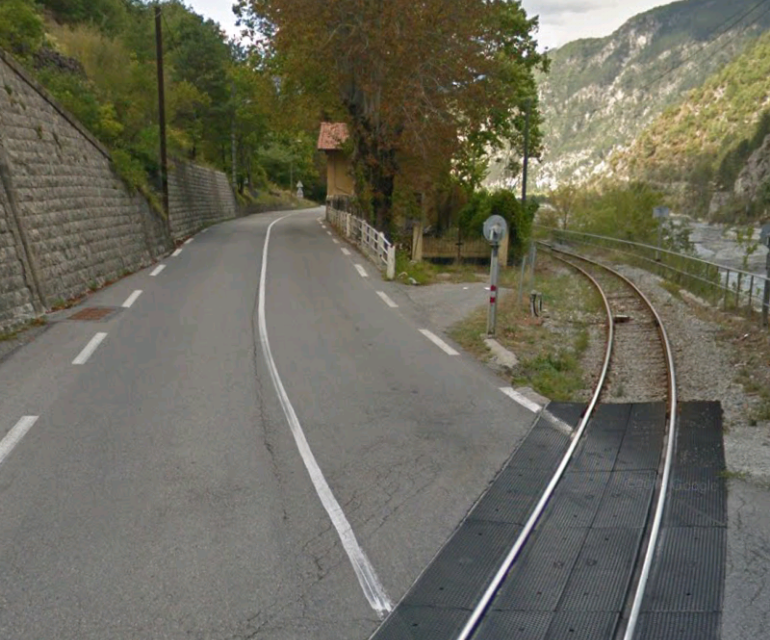 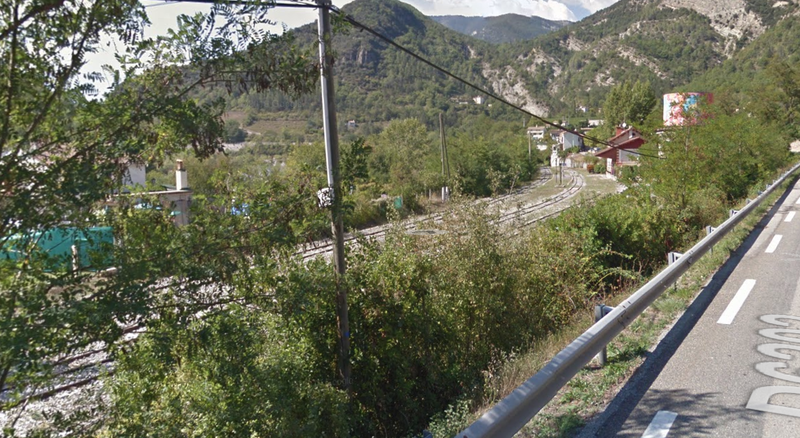 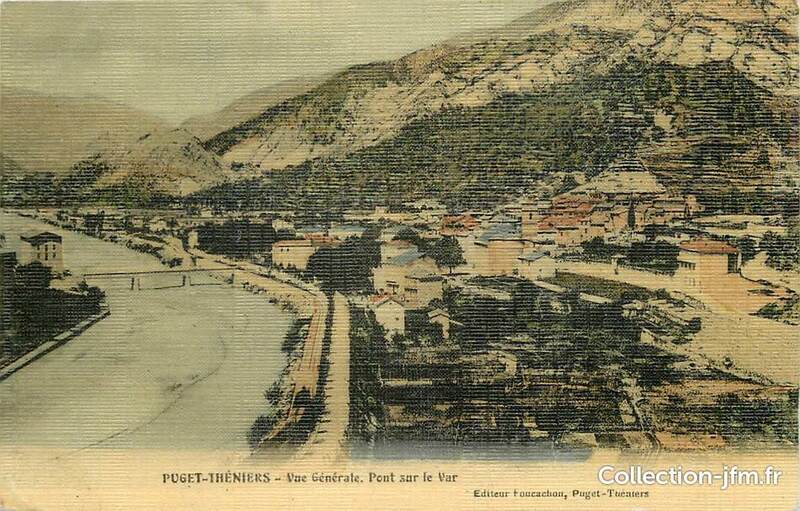 After leaving Puget-Théniers, heading west towards Digne-les-Bains, trains continues tofollow the river course. 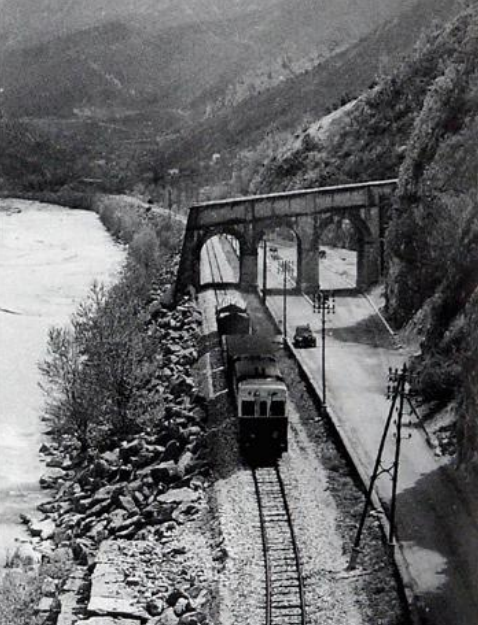 The railway, for about one kilometre, remains on the northside of the river. 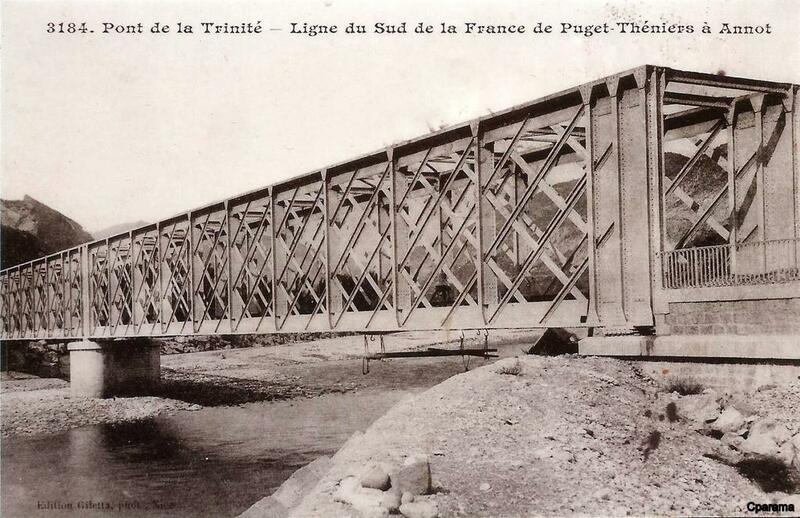 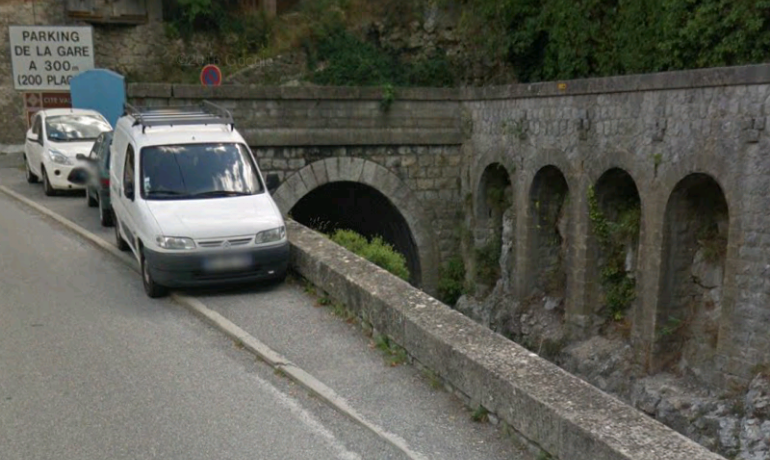 Trinité bridge on the Var between Puget-Théniers and Entrevaux. 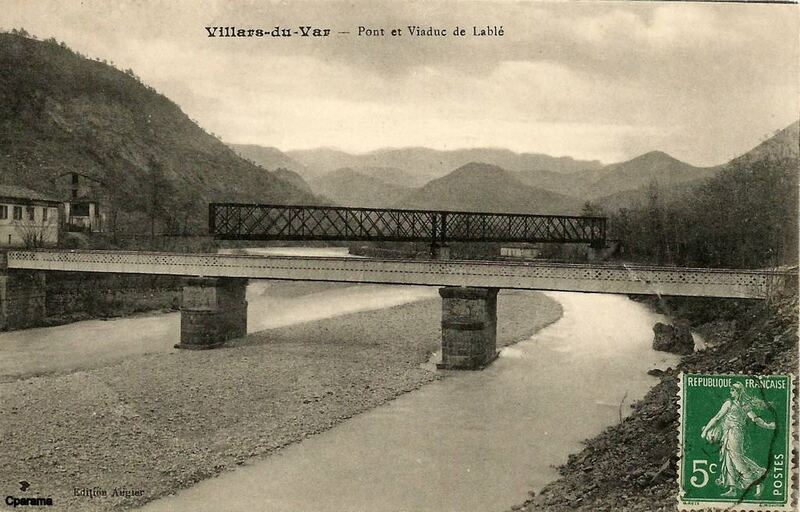 Trinité bridge, taken from the south side of the River Var. 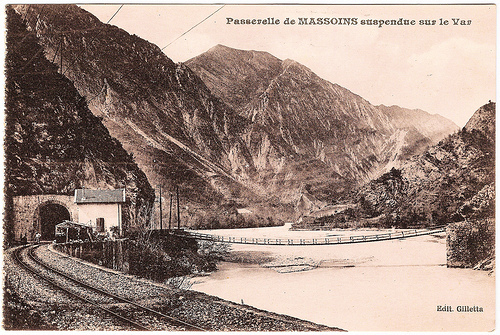 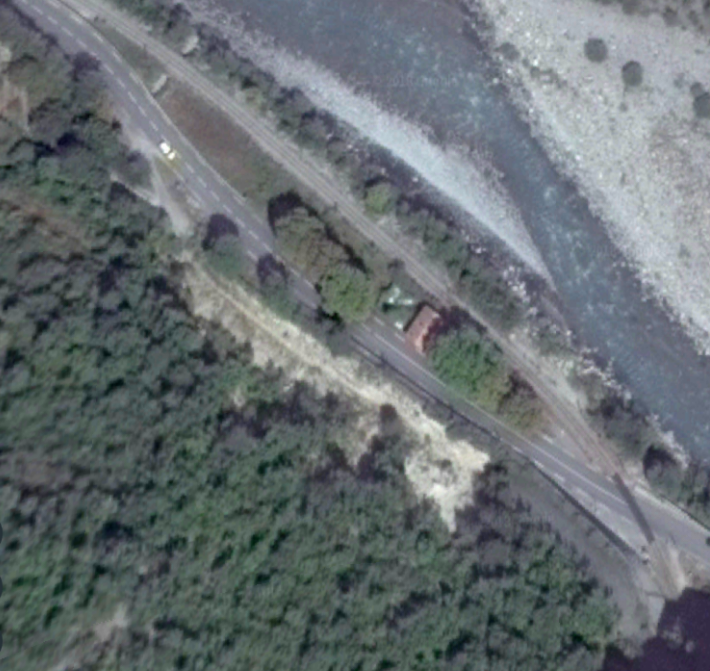 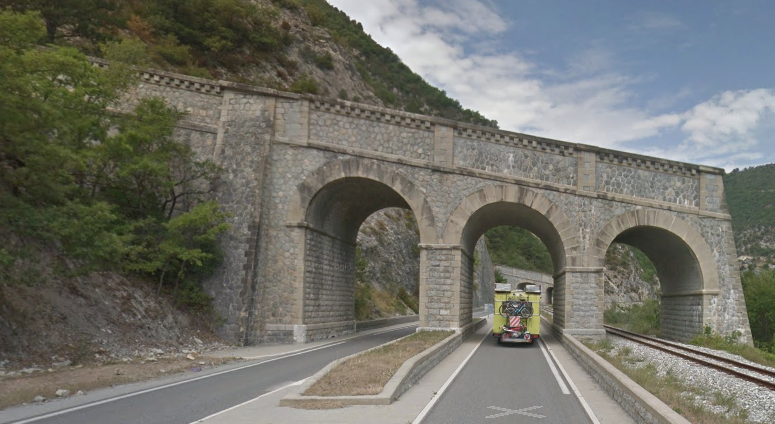 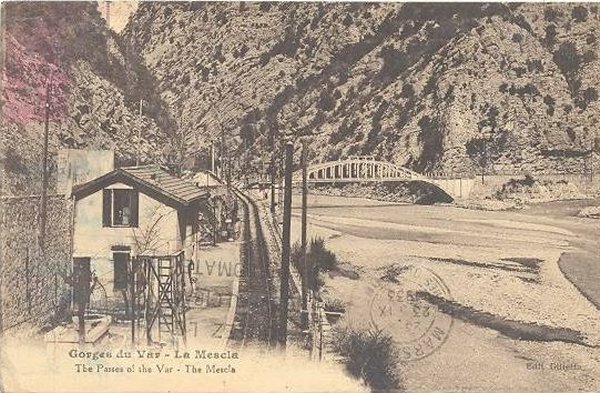 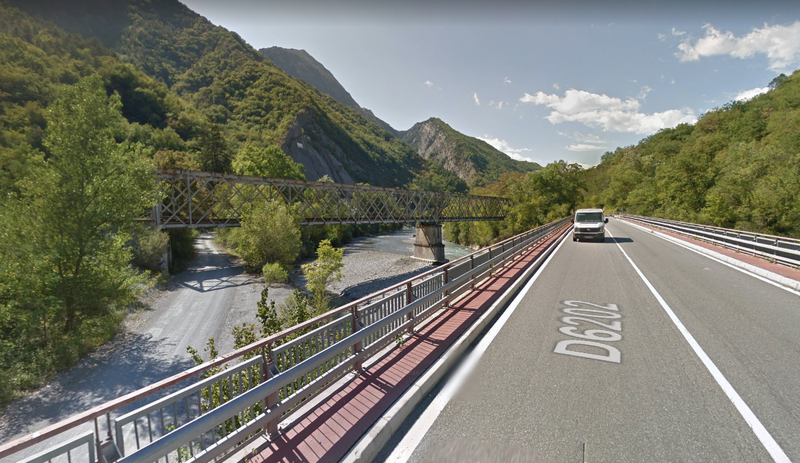 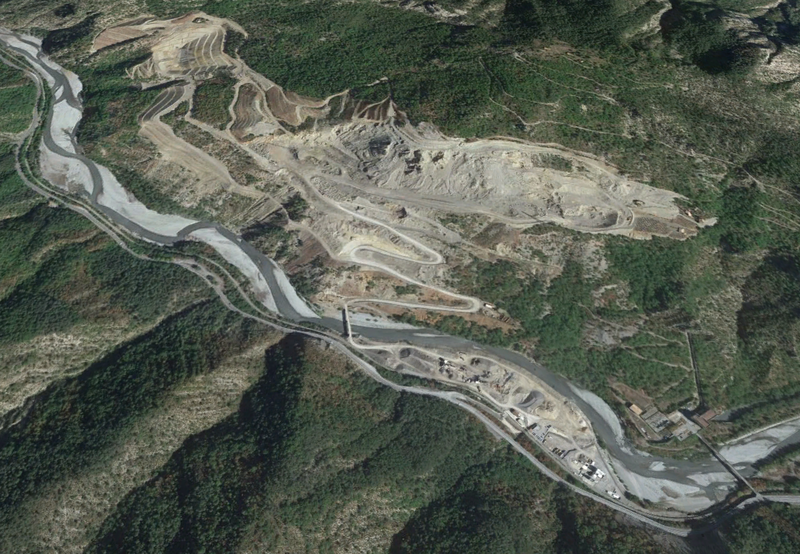 The road crosses the River Var at this point (just north of the East Portal of the tunnel). 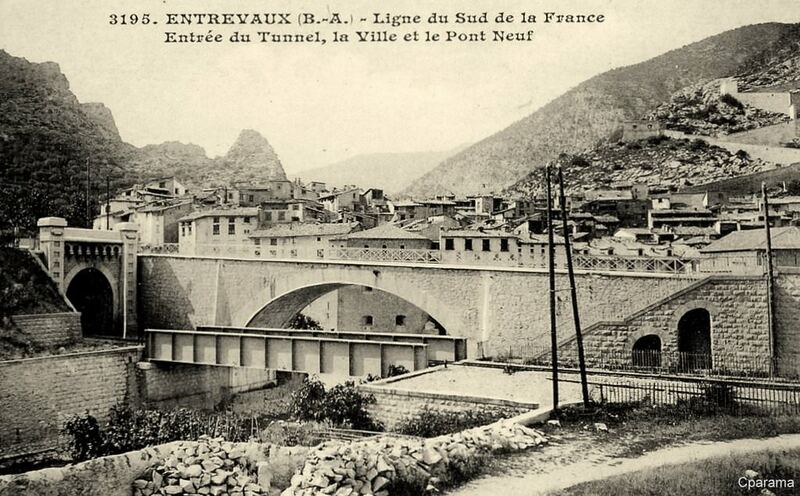 The location is known as ‘Le Pont Noir’. 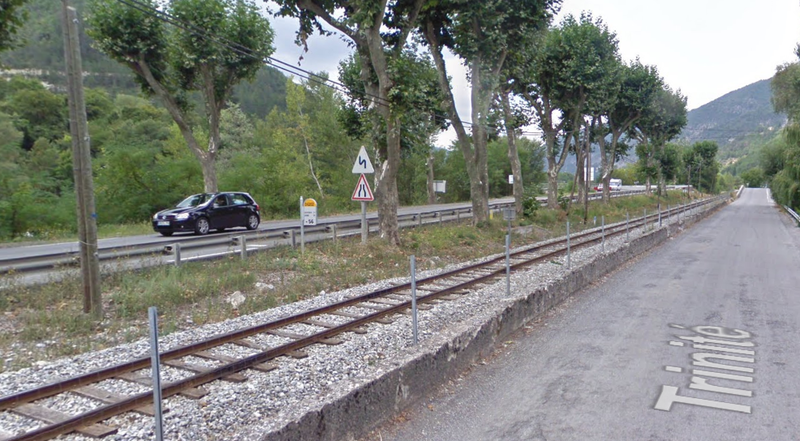 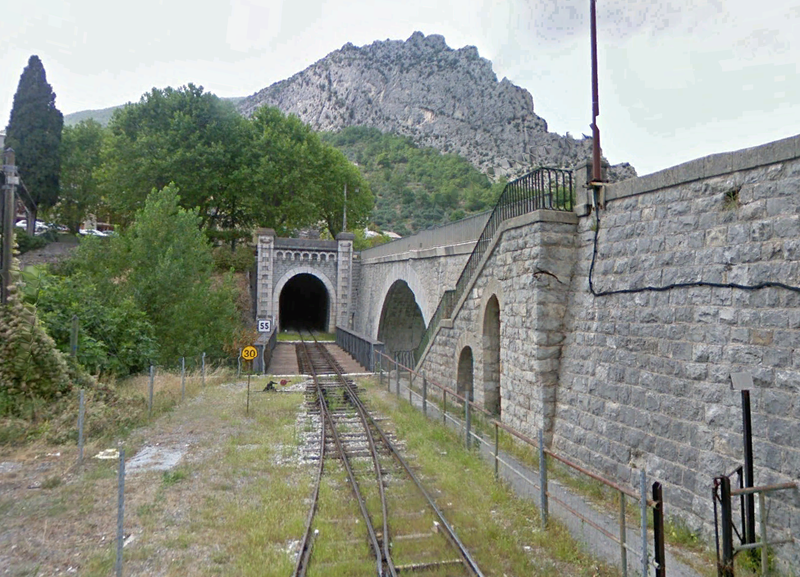 The railway remains on the south side of the valley for another kilometre or so before reaching Le Pont Gueydan. 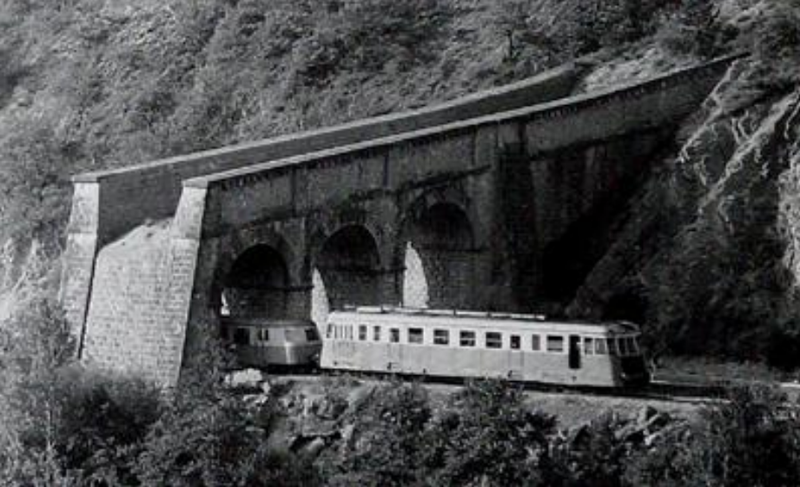 The adjacent photograph shws the railway bridge as it was before 1994. 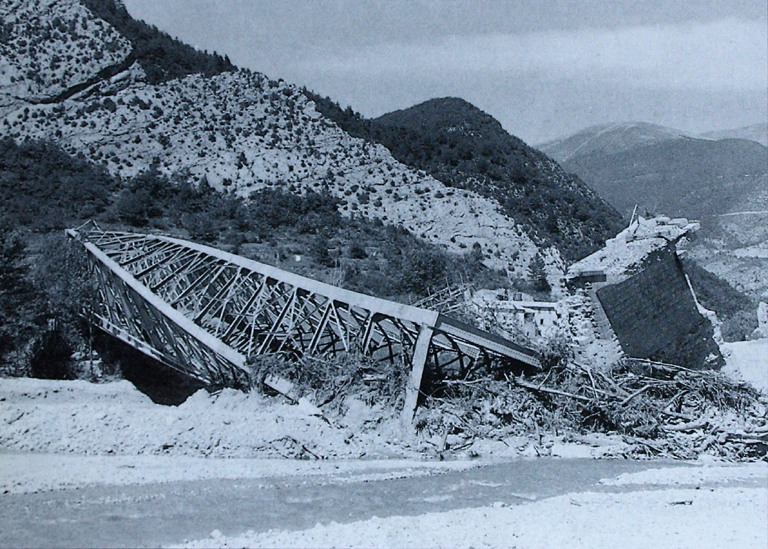 The image immediately below shows the structure after the floods. 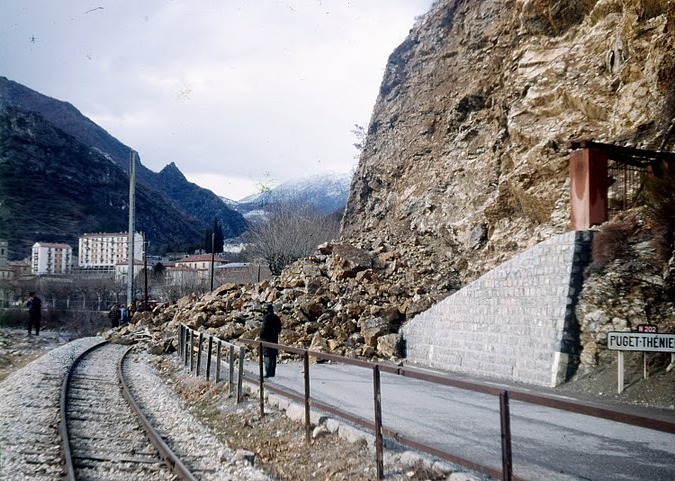 The four images above show the new railway brdige istalled after the floods of 1994. 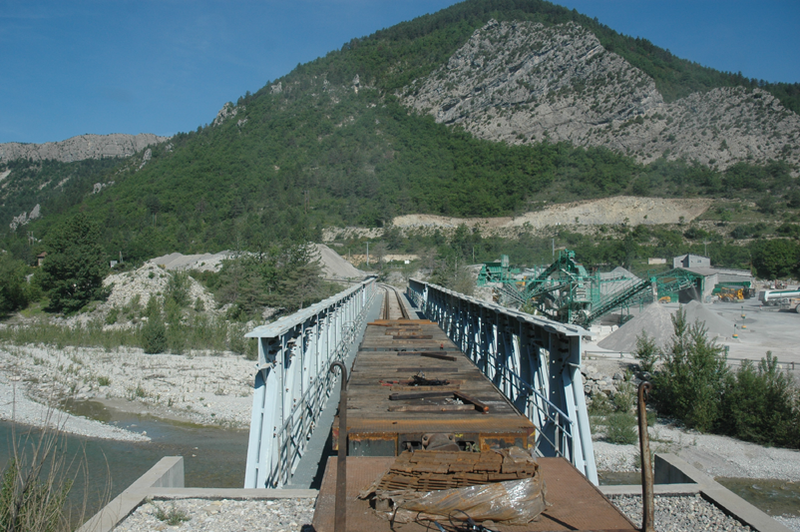 The Bridge spans the Le Coulomp. 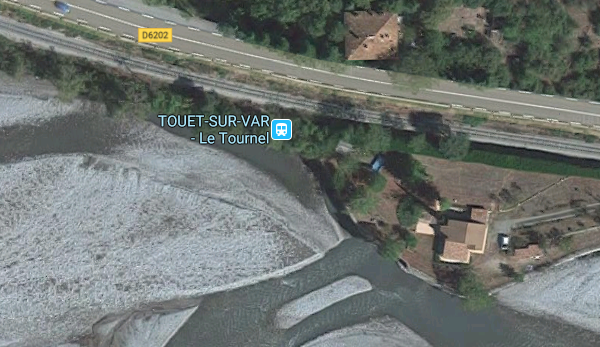 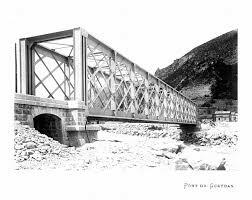 Just to the east of the bridge, the River Var turns sharply to the north and the railway follows the course of a tributary – Le Coulomp. 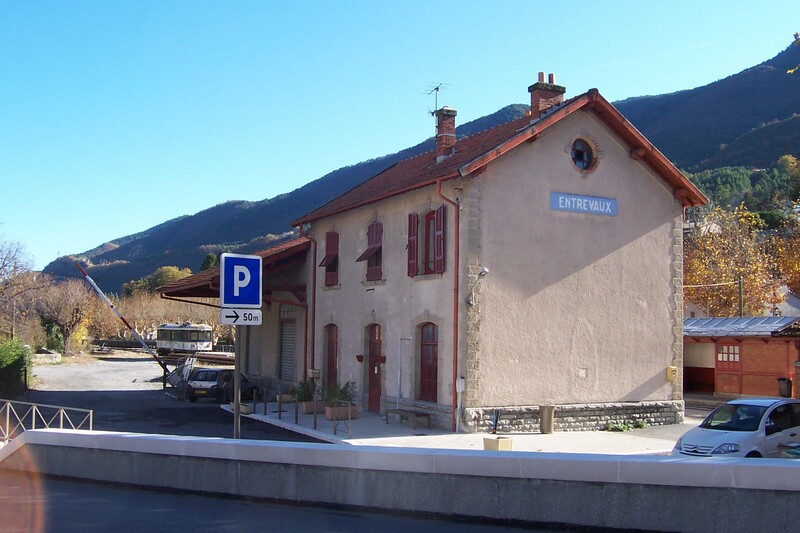 The first station after the bridge is Saint Benoit Pont de Gueydan. 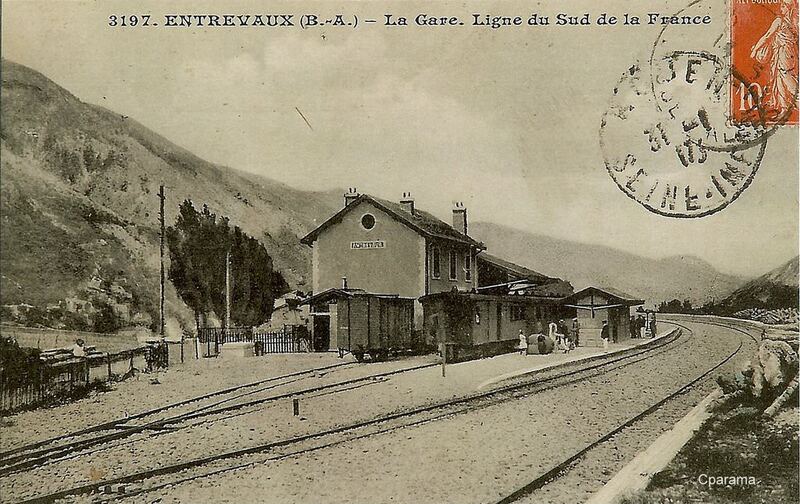 This station was a junction station. 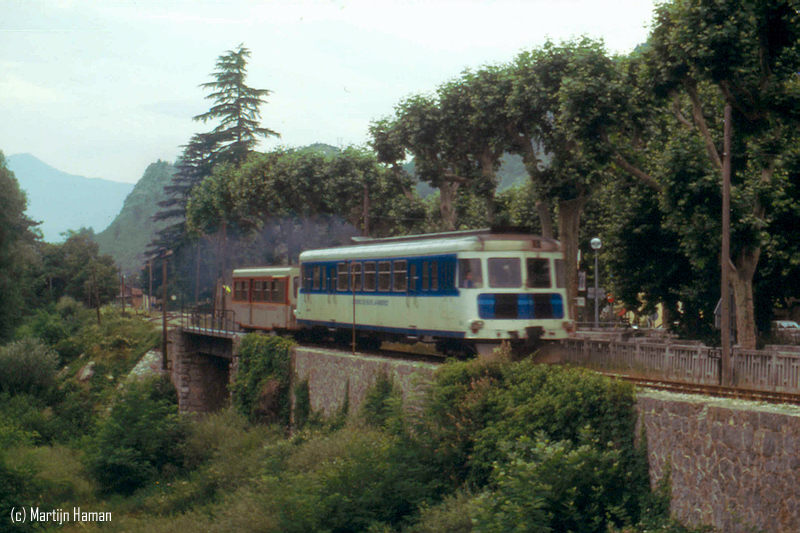 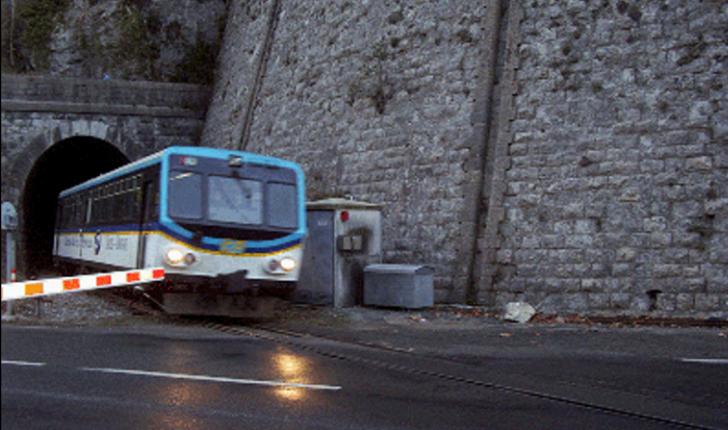 The TAM ran a tramway north up the valley of the Var from Le Pont de Gueydan. 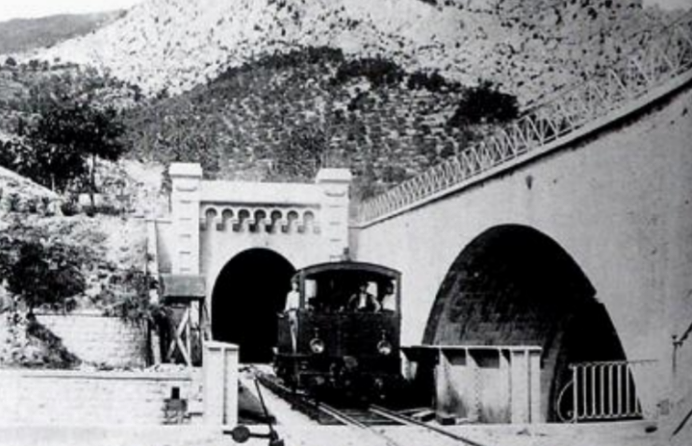 It was the starting point of the tramway, which was often referred to as the Haut-Var tramway, which ran as far as Guillaumes. 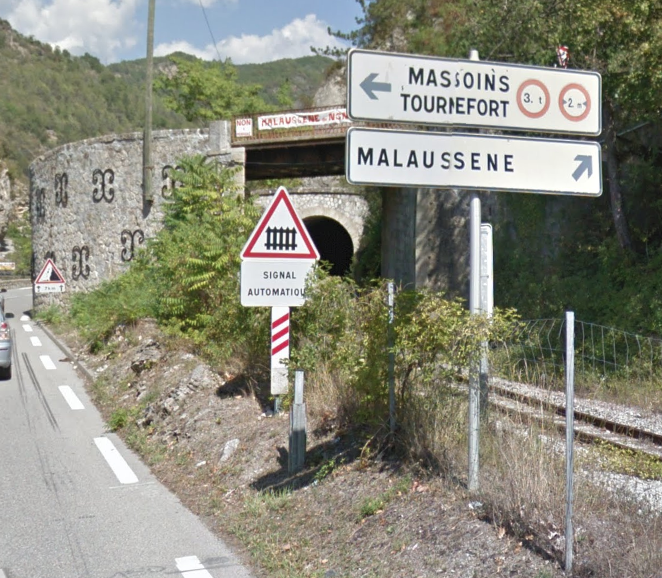 This is the end of this stage of the journey. 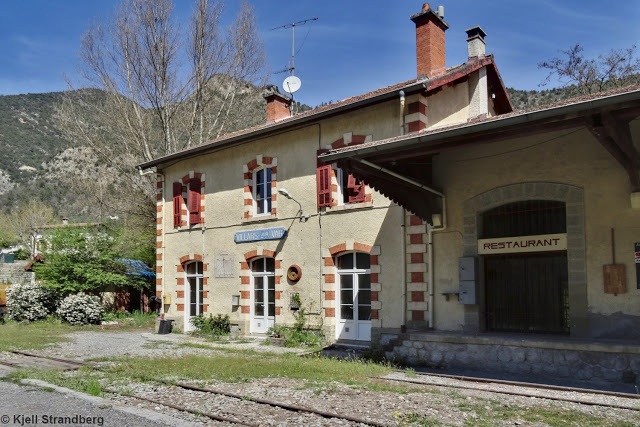 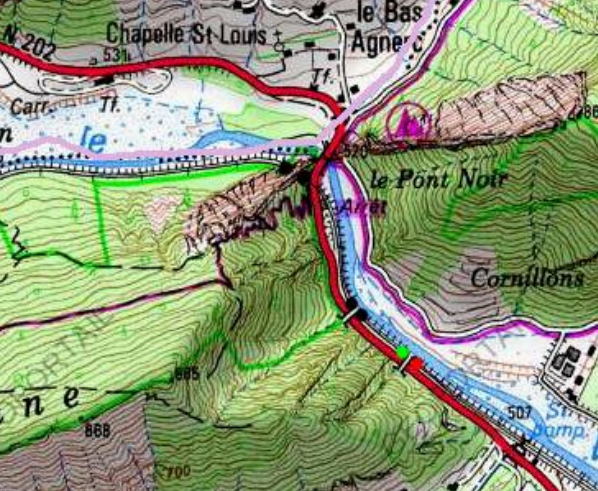 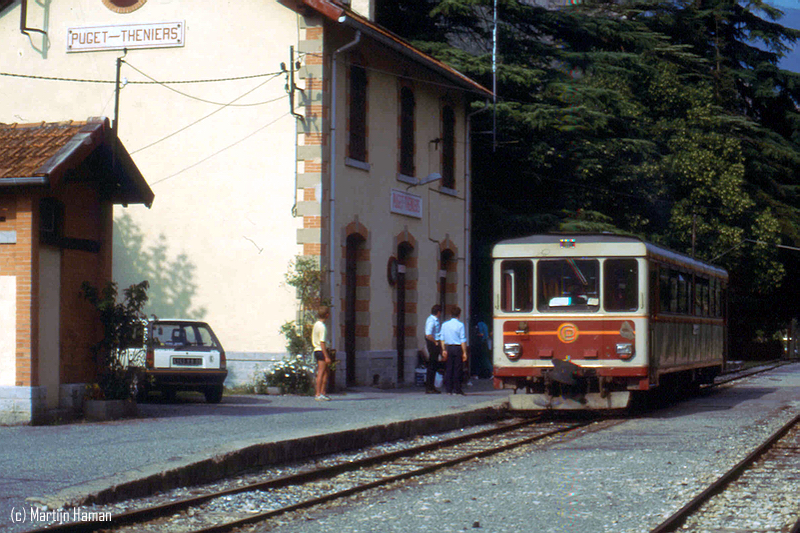 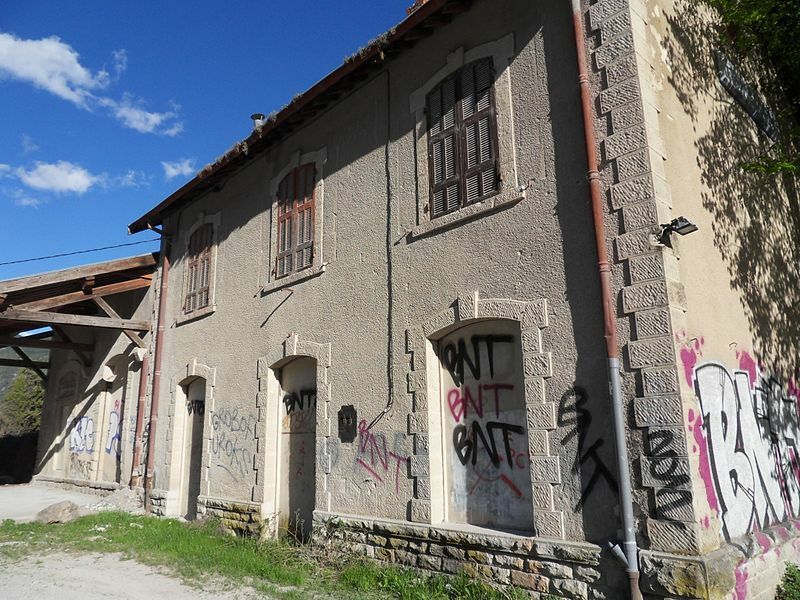 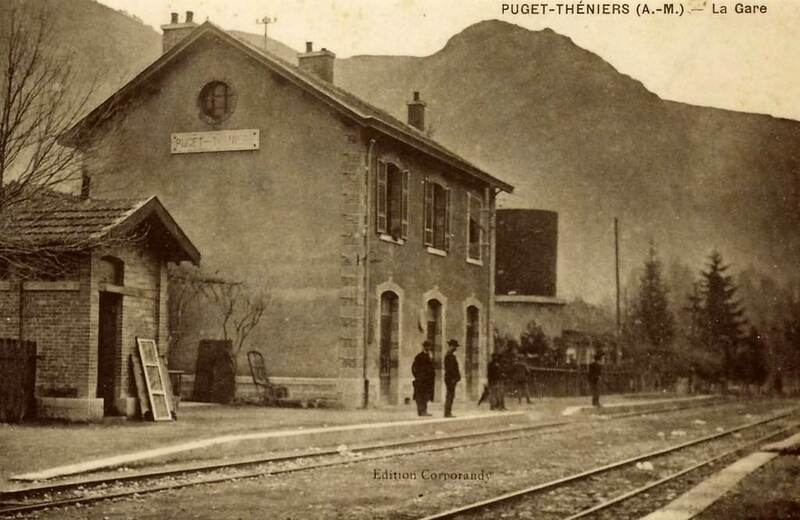 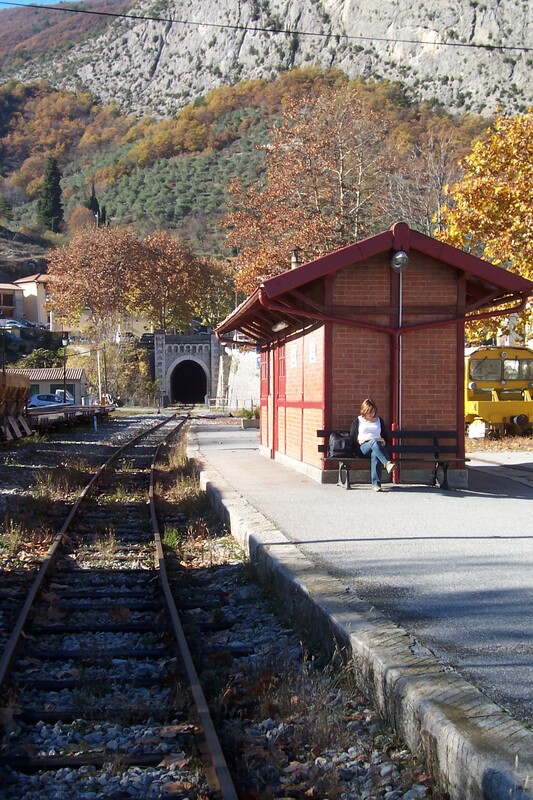 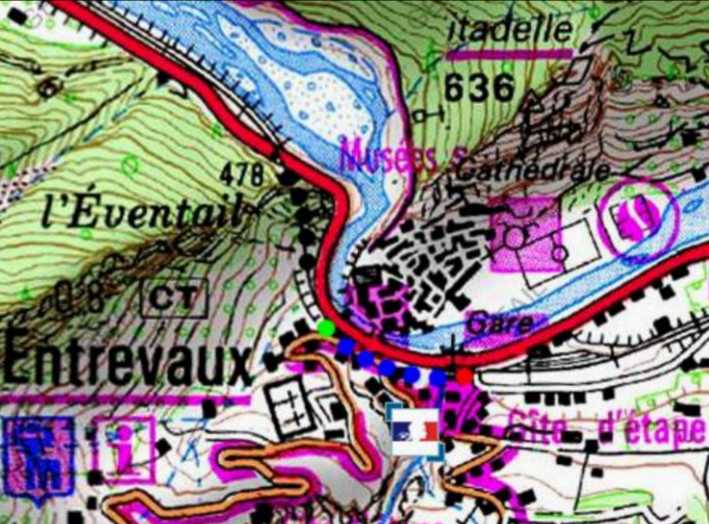 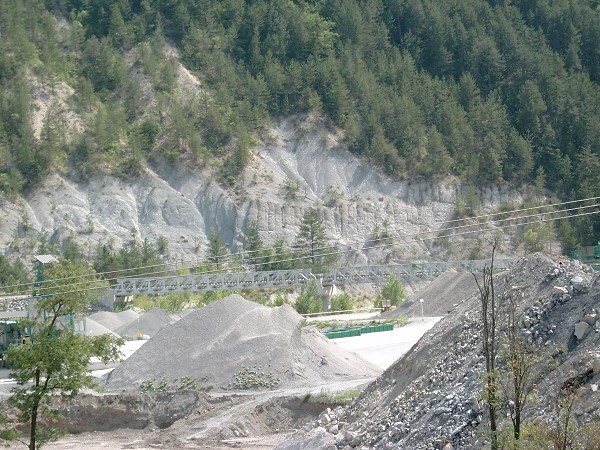 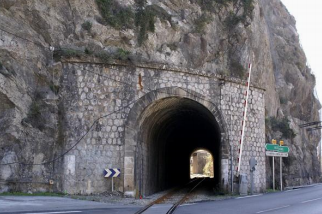 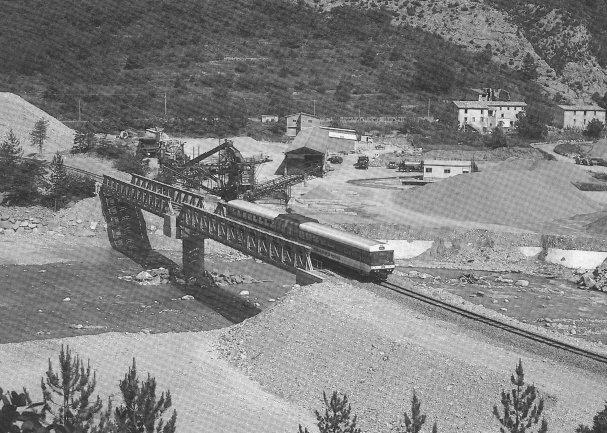 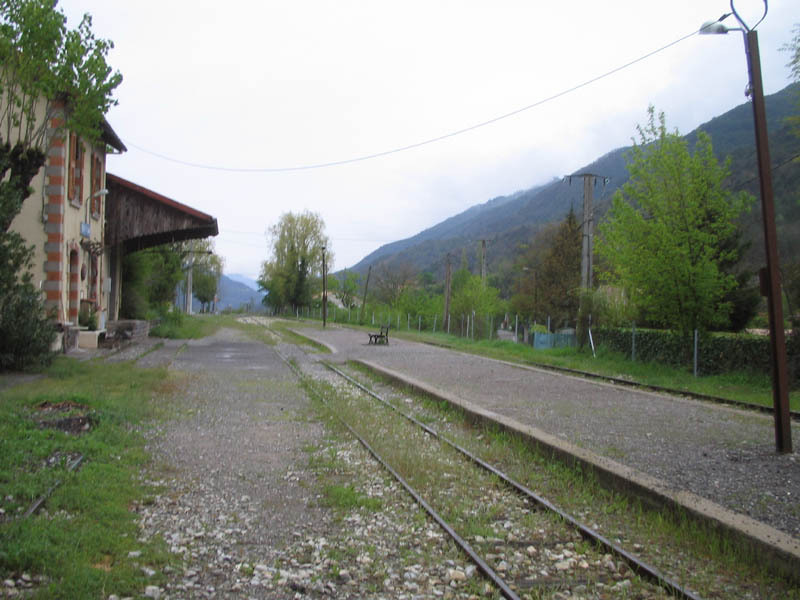 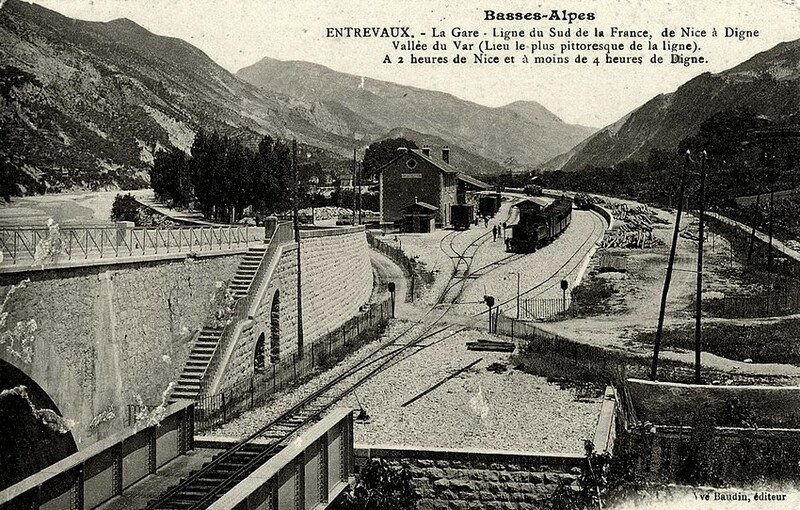 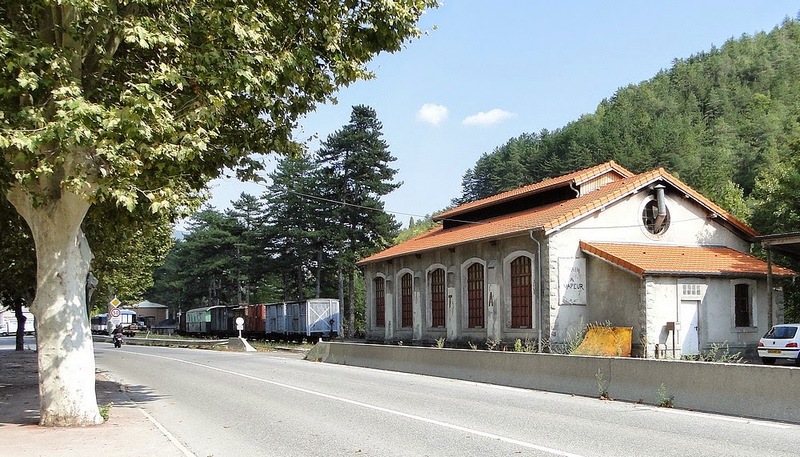 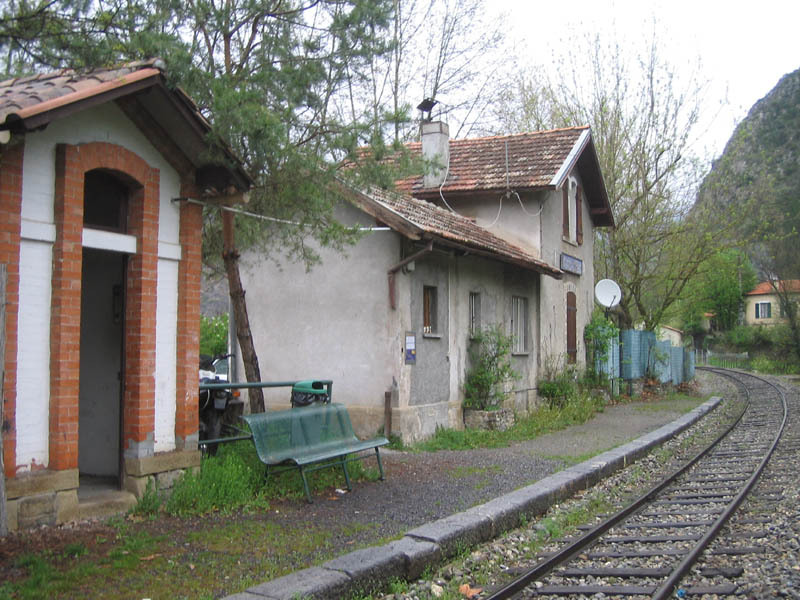 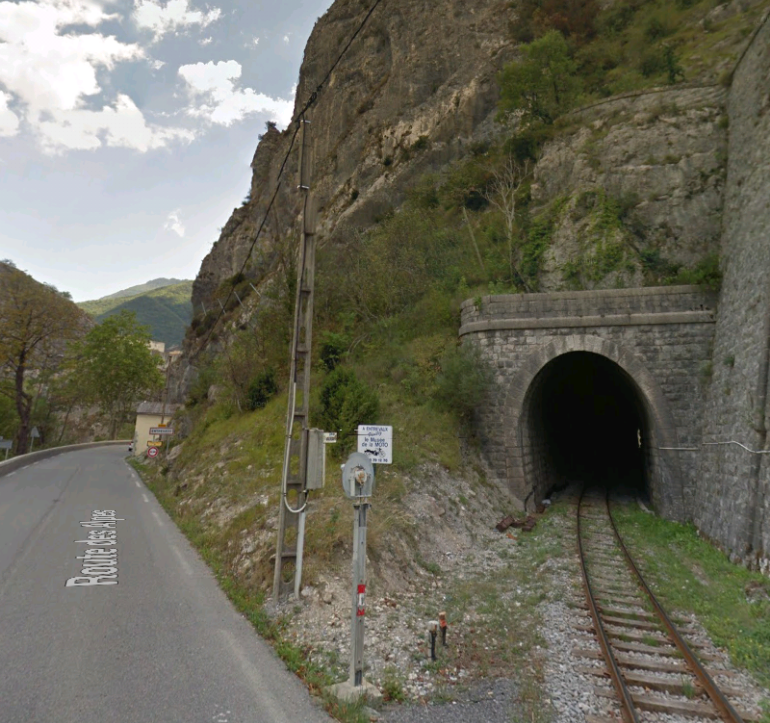 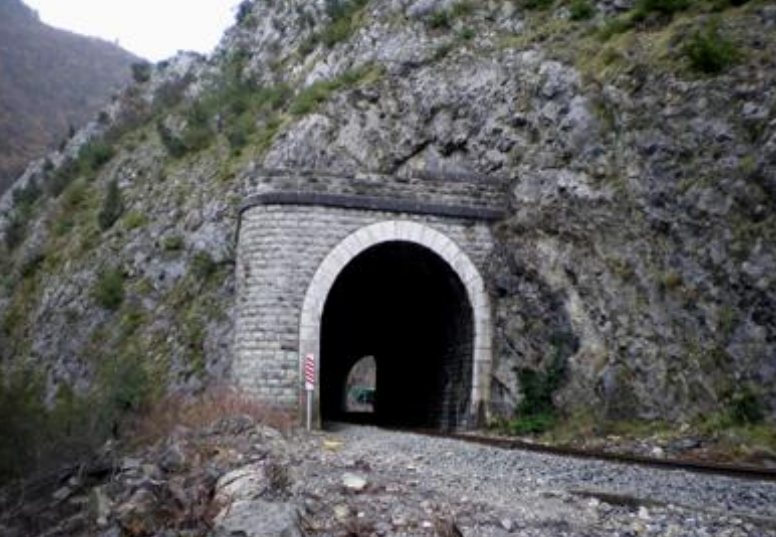 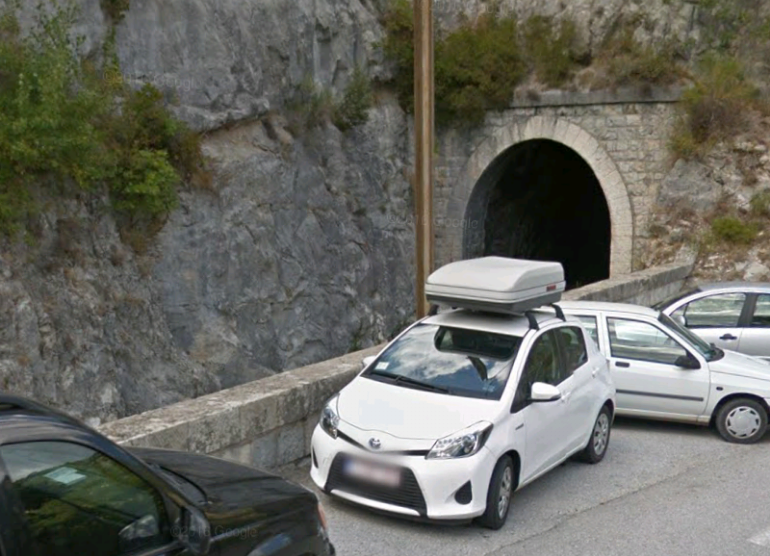 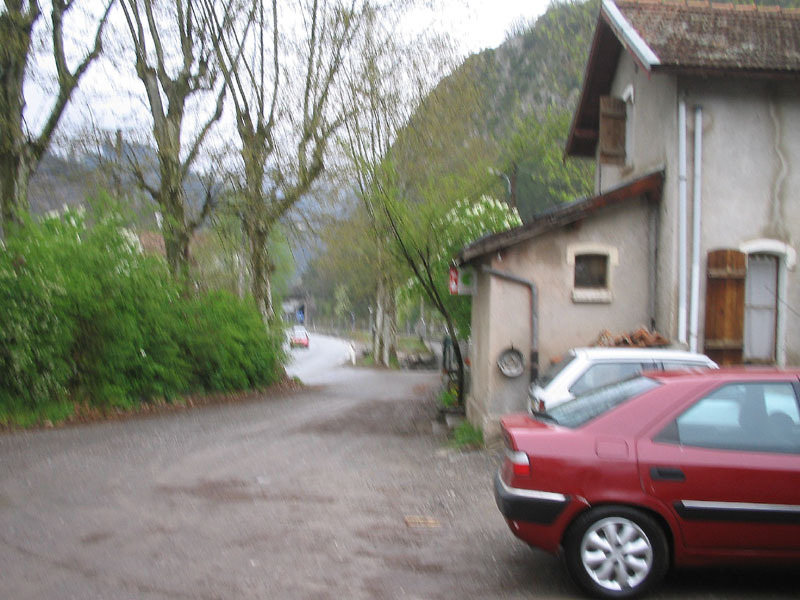 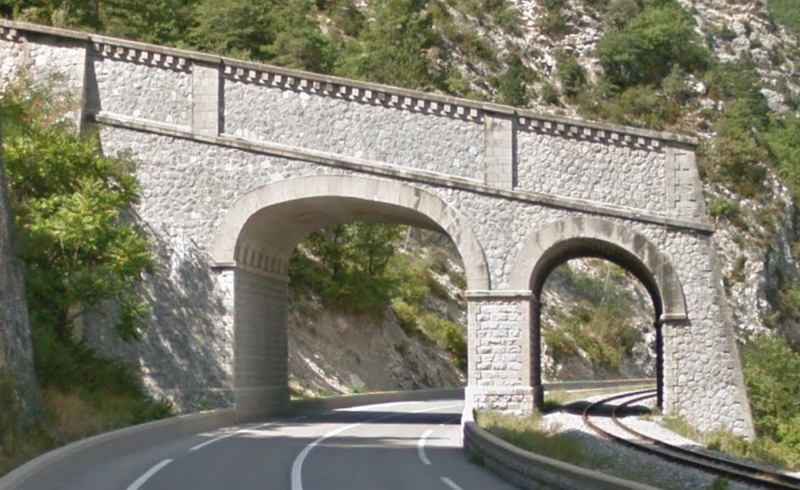 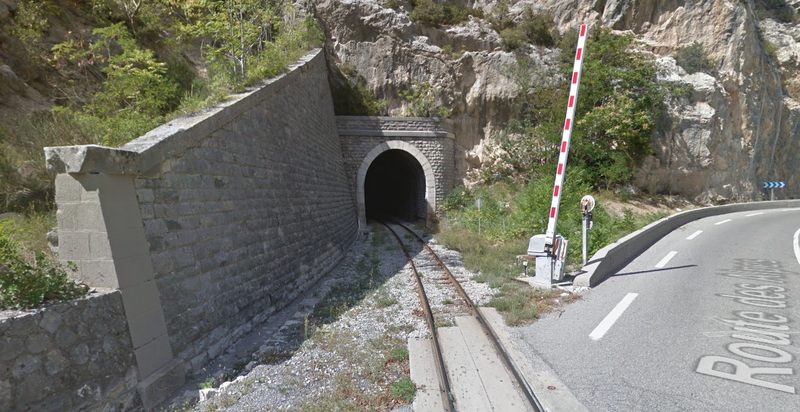 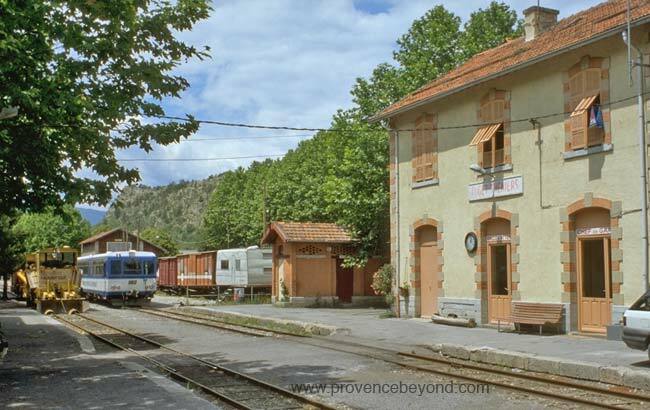 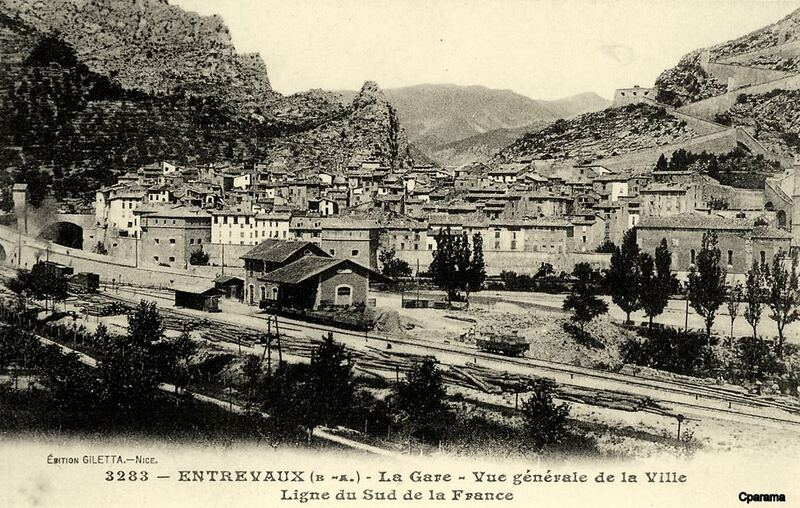 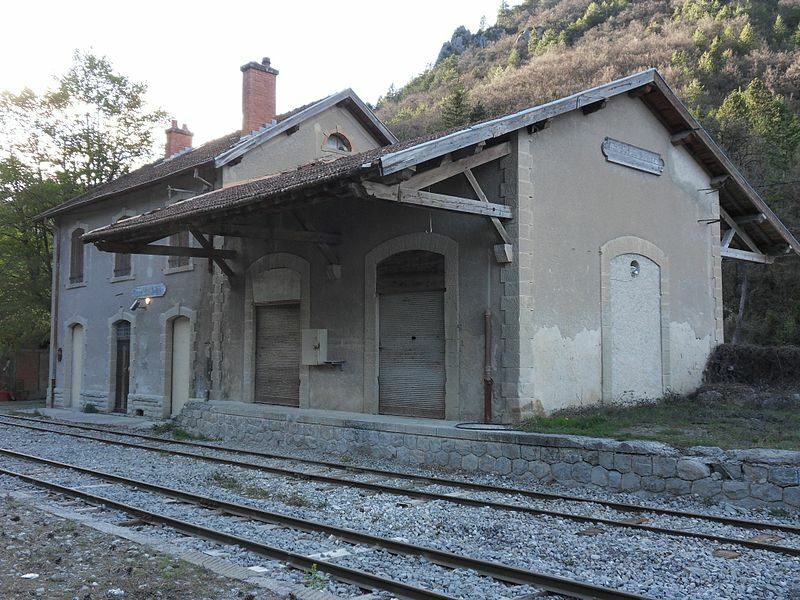 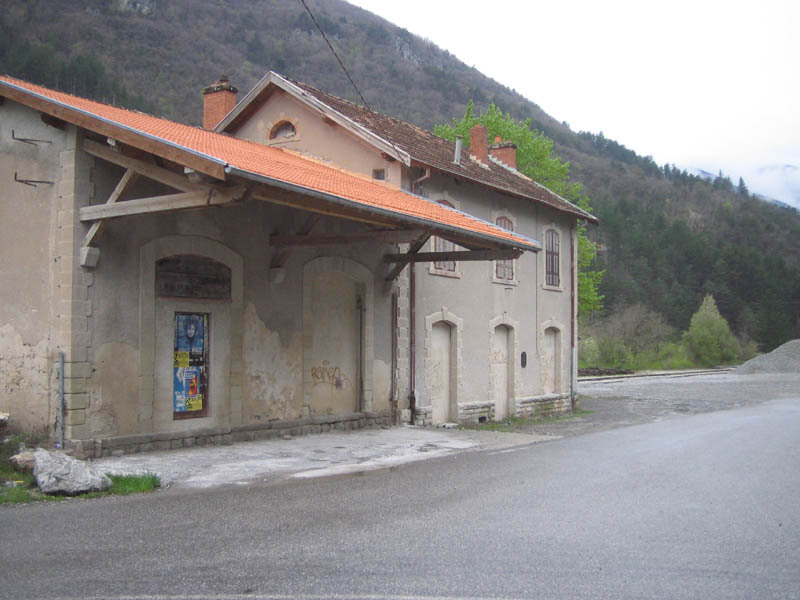 http://www.tunnels-ferroviaires.org/tu06/06078.1.pdf, accessed on 18th July 2018.
https://trainmec.blogspot.com/2016/04/five-minutes-at-villars-sur-var-station.html, accessed on 11th July 2018.
http://www.lecomtedenice.fr/Visi_nice/val_var_villars_sur_var_village.html, accessed on 19th July 2018.
http://www.map-france.com/Villars-sur-Var-06710/photos-Villars-sur-Var.html, accessed on 19th July 2018.
https://www.cparama.com/forum/villars-sur-var-t23761.html, accessed on 19th July 2018.
https://www.delcampe.net/fr/cartes-postales/europe/france/06-alpes-maritimes/autres-communes?f=lieux:chemin-de-fer, accessed on 19th July 2018.
https://dossiersinventaire.maregionsud.fr//gertrude-diffusion/dossier/gares-des-chemins-de-fer-de-provence/5db69410-c3ec-4217-b30c-92f975a65c27/illustration/66, accessed on 19th July 2018.
http://cccp.traindespignes.free.fr/gare-touet.html, accessed on 19th July 2018.
https://fr.m.wikipedia.org/wiki/Touët-sur-Var, accessed on 19th July 2018.
https://www.cparama.com/forum/puget-theniers-t8978.html, accessed on 20th July 2018.
https://www.geneanet.org/cartes-postales/view/271322#0, accessed on 20th July 2018.
https://collection-jfm.fr/p/cpa-france-06-puget-theniers-222734, accessed on 20th July 2018.
https://collection-jfm.fr/p/cpa-france-06-puget-theniers-vue-generale-pont-sur-le-var-carte-toilee-7207, accessed on 20th July 2018.
http://www.collection-jfm.fr/p/cpa-france-06-puget-theniers-sur-la-route-des-alpes-et-sur-les-bords-du-var-171856, accessed on 20th July 2018.
https://collection-jfm.fr/p/cpa-france-06-puget-theniers-la-place-et-la-roudoule-21338, accessed on 20th July 2018.
http://cccp.traindespignes.free.fr/gare-puget.html, accessed on 20th July 2018.
http://cccp.traindespignes.free.fr/phototheque-digne.html, accessed on 20th July 2018.
http://www.beyond.fr/villages/puget-theniers-provence-france.html, accessed on 20th July 2018.
https://www.gecp-asso.fr, accessed on 20th July 2018.
https://trainmec.blogspot.com/2015/02/train-des-pignes-steam-train-winter.html, accessed on 20th July 2018.
https://www.pinterest.co.uk/pin/356206651752278128/?lp=true, accessed on 1st July 2018.
http://www.internationalsteam.co.uk/tales/francetales04.htm, accessed on 20th July 2018.
http://www.dronestagr.am/citadelle-dentrevaux, accessed on 20th July 2018.
https://www.cparama.com/forum/entrevaux-t17950.html accessed on 20th July 2018.
http://www.tunnels-ferroviaires.org/tu04/04076.5.pdf, accessed on 20th July 2018.
http://www.tunnels-ferroviaires.org/tu04/04076.4.pdf, accessed on 20th July 2018.
http://www.tunnels-ferroviaires.org/tu04/04076.3.pdf, accessed on 21st July 2018.
http://www.tunnels-ferroviaires.org/tu04/04076.2.pdf, accessed on 21st July 2018.
http://www.tunnels-ferroviaires.org/tu04/04076.1.pdf, accessed on 21st July 2018.
http://ollivier.haemmerle.free.fr/entrevaux.html, accessed on 21st July 2018. 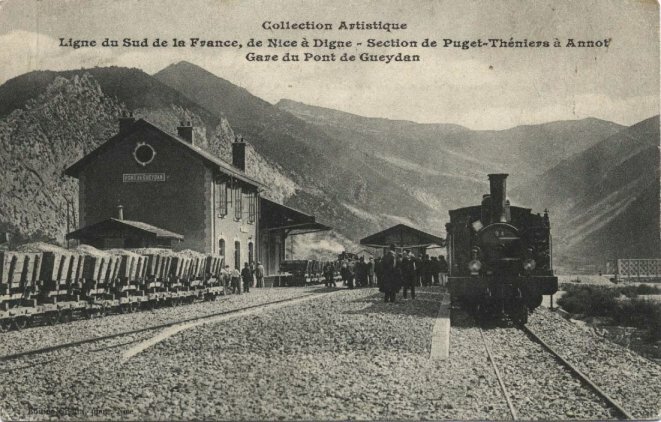 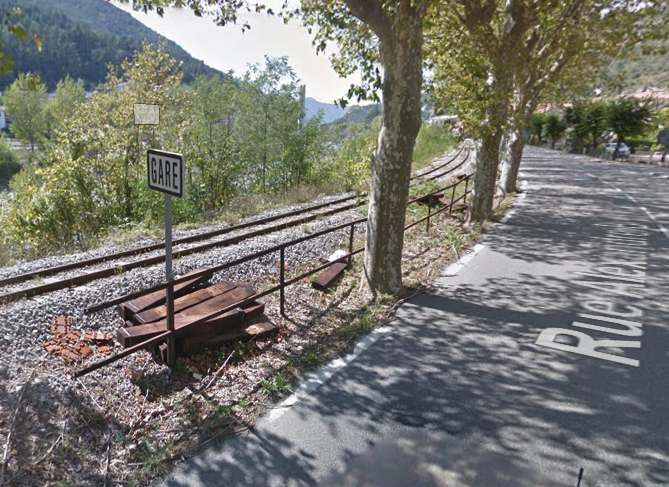 This entry was posted in Railways and Tramways Around Nice, Railways Blog on July 21, 2018 by rogerfarnworth.